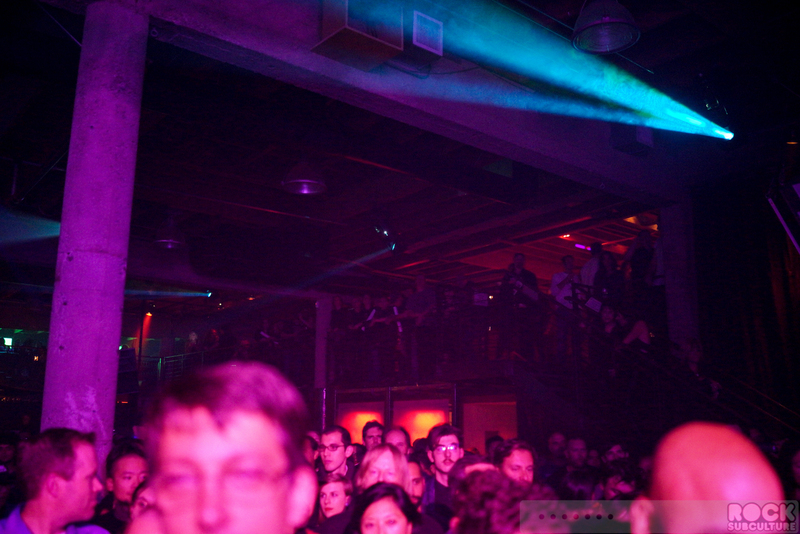 This was actually my first concert at Mezzanine, and I have to say as a concert venue it really exceeded all of my expectations. 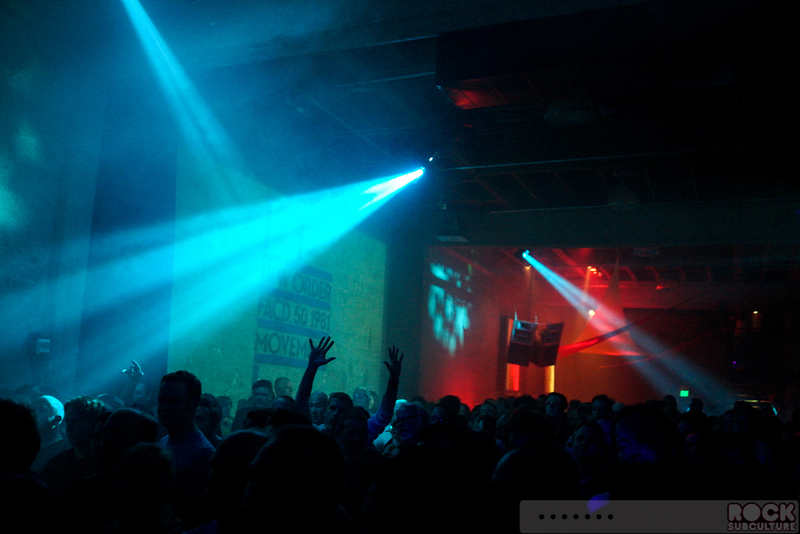 I imagined kind of a hole in the wall sort of place, but once inside was impressed at not just the size and two level layout but the style and look of the place – really top notch. Backing up a bit, I had a bit of time to spend outside, pre-show, and even with that, was impressed with the sound quality, hearing the sound check from outside. 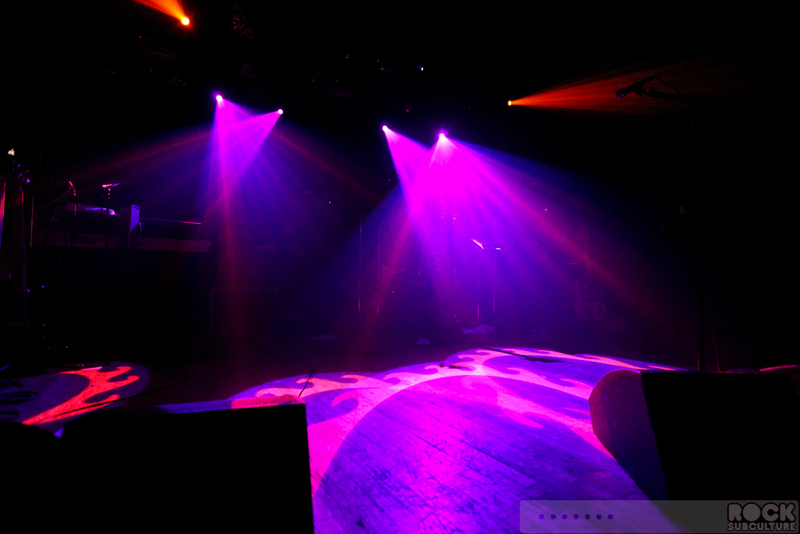 I arrived quite early, as I was doing photography, and understood that there was no photo pit, so wanted to arrive early to pick out a spot on the floor against the stage up front, without having to ask any fans to make room with a late arrival. 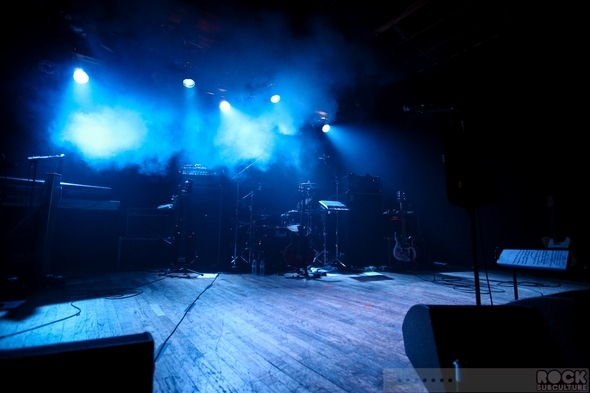 I think I arrived at the venue about about 6:30, and doors was pushed back from 8:00 to 9:00, so it was quite a wait, but had great company with a gentleman with the tour and other fans, chatting outside. 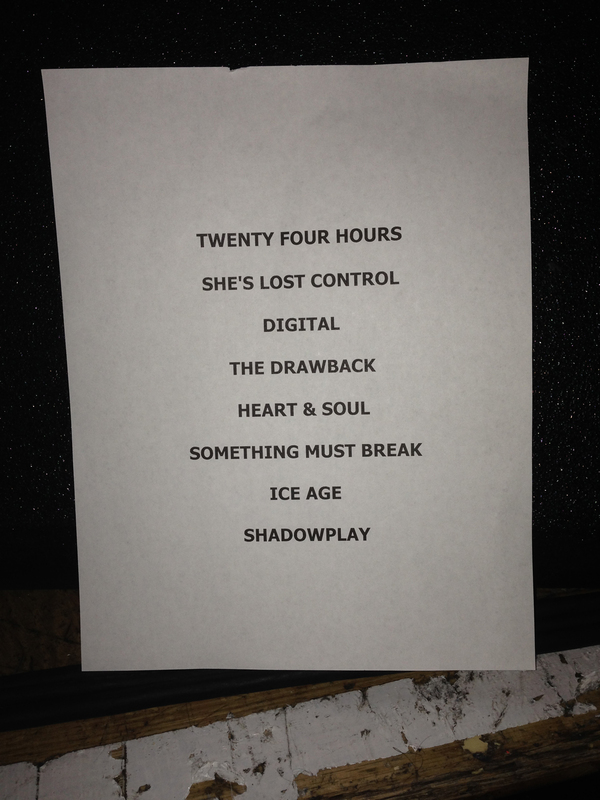 A funny thing about the other surprise… I lost count of the number of people who came up to ask for the set time for Peter Hook & The Light, who had no interest in catching opening and supporting act Slaves of Venus, and wanted to time their return just to catch the main set. 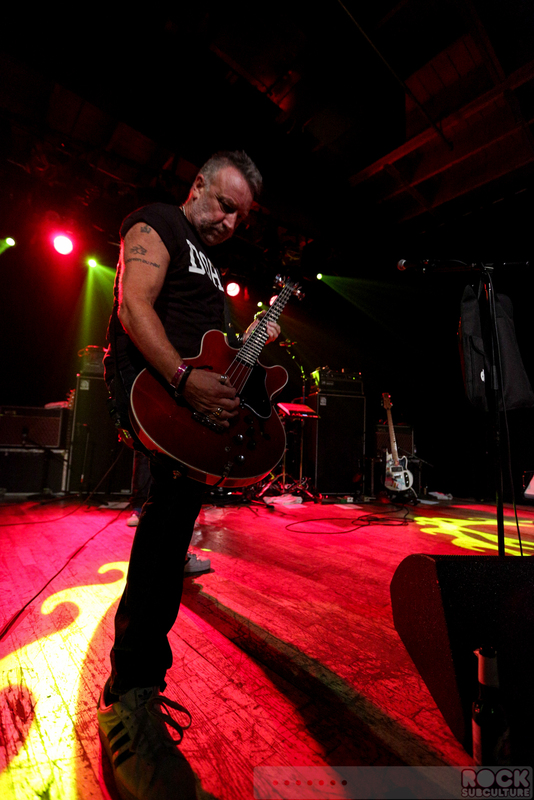 Slaves of Venus were due on at 9:30, with Peter Hook & The Light scheduled to go on at 10:30, an hour later, expected to run until 12:40… a late night. 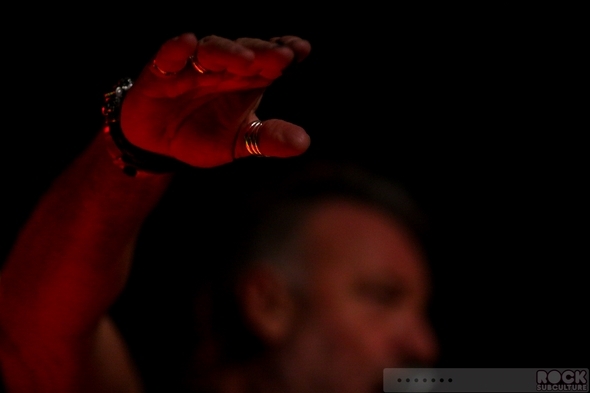 So who were this mysterious Slaves of Venus? Well, the gentleman I spent some time talking with outside prior to doors came out onto the stage to introduce Slaves of Venus, remarking that this is their first tour… and to my surprise, and apparently to the surprise of most in attendance, Peter Hook & The Light walk out onto the stage, but grins on their faces. 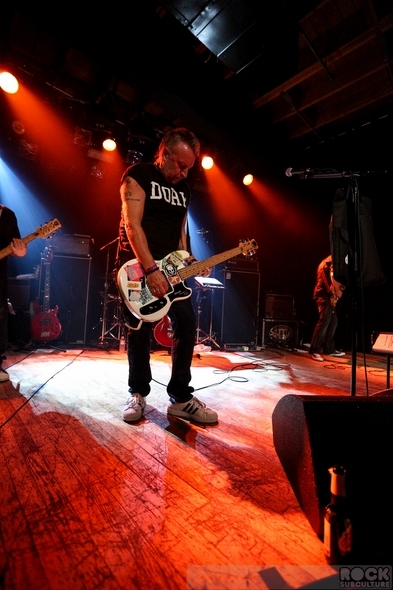 Essentially, Slaves of Venues of just another name under which the band were playing – so they were basically their own supporting band. 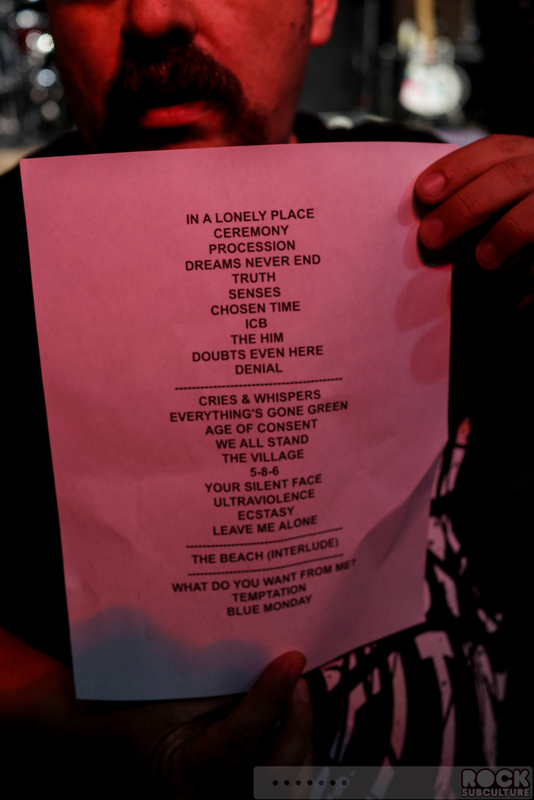 Funny and clever, and I have to wonder about those who completely missed this opening set, which was an all Joy Division set. 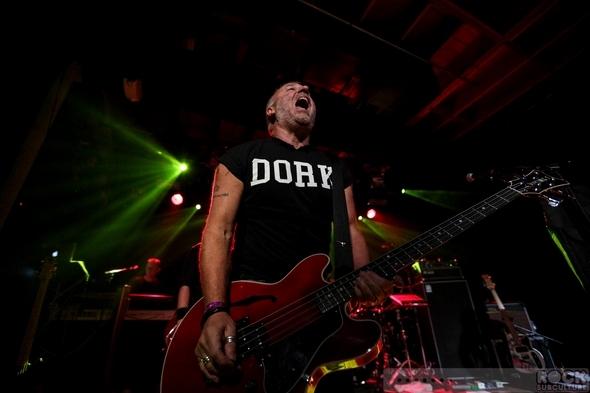 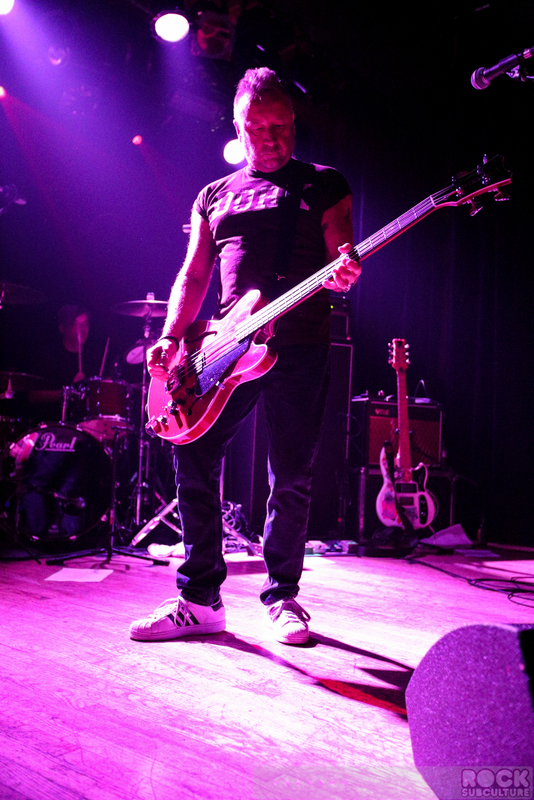 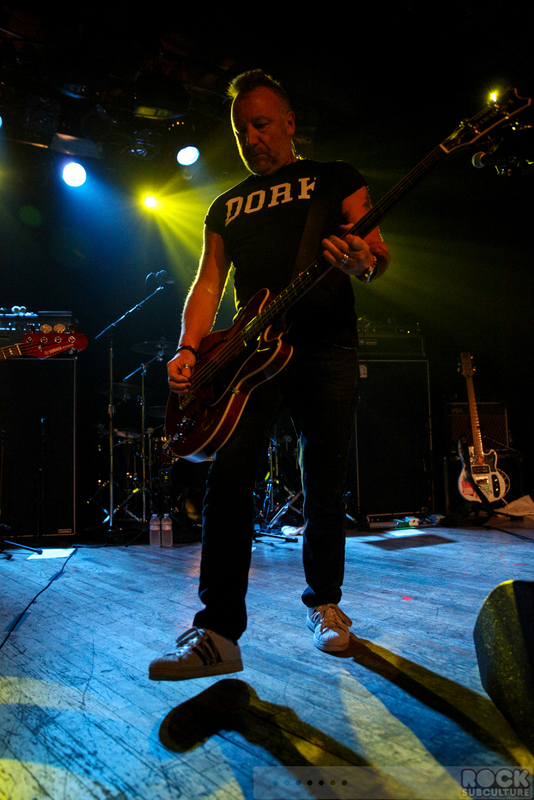 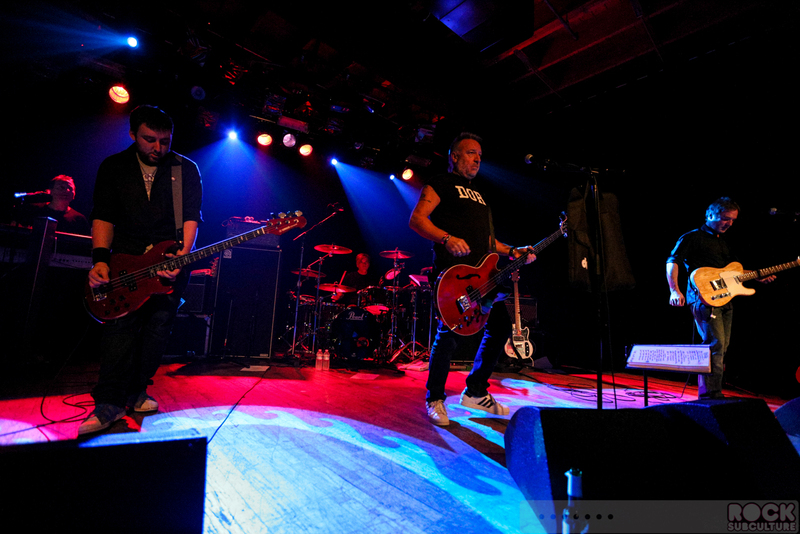 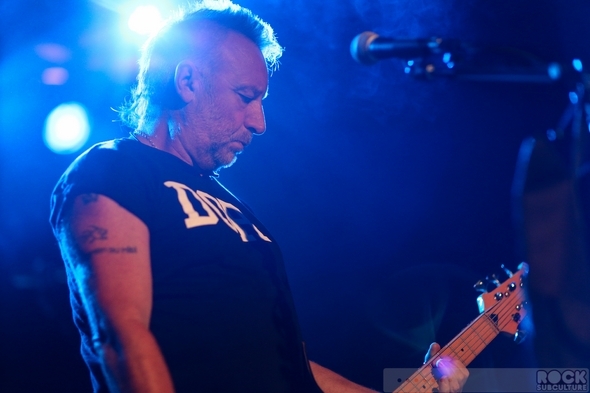 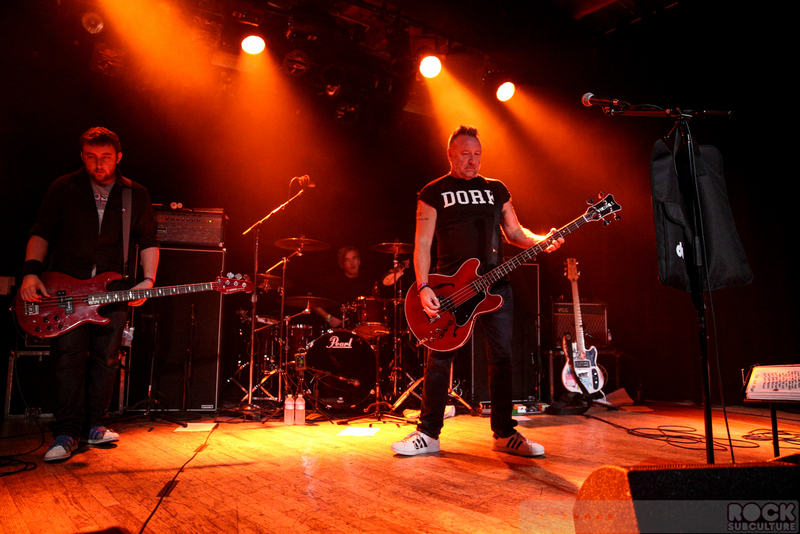 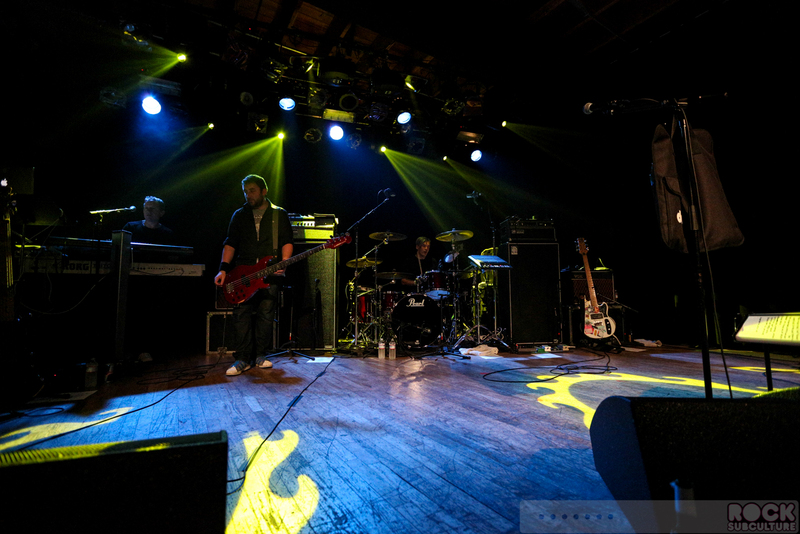 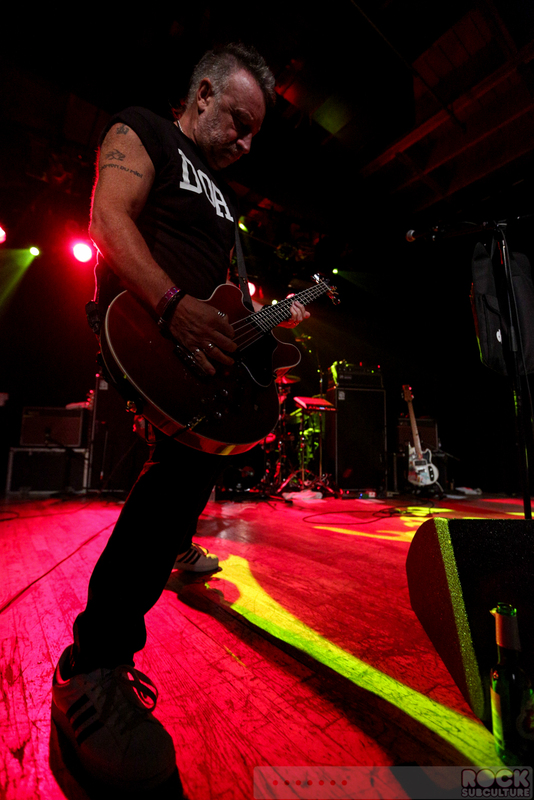 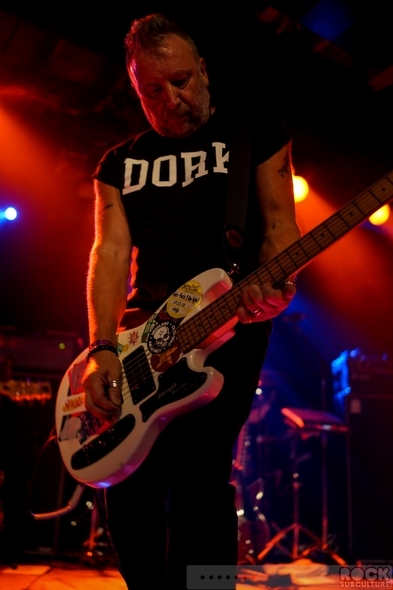 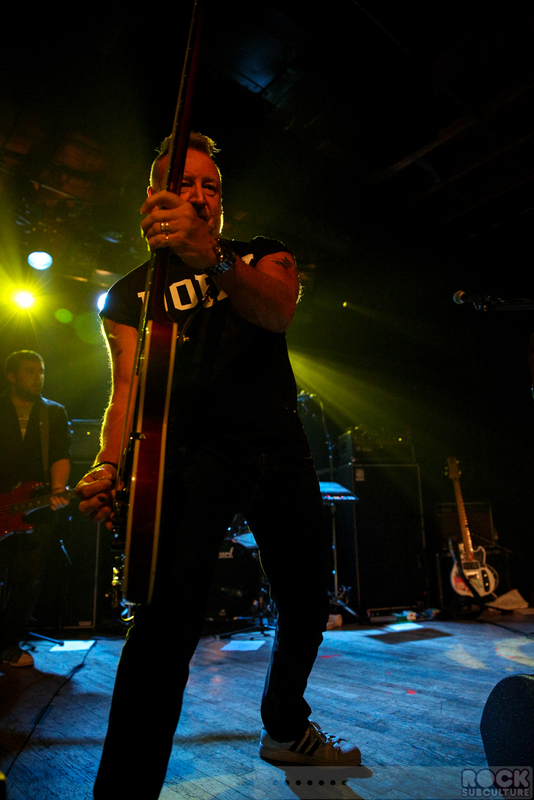 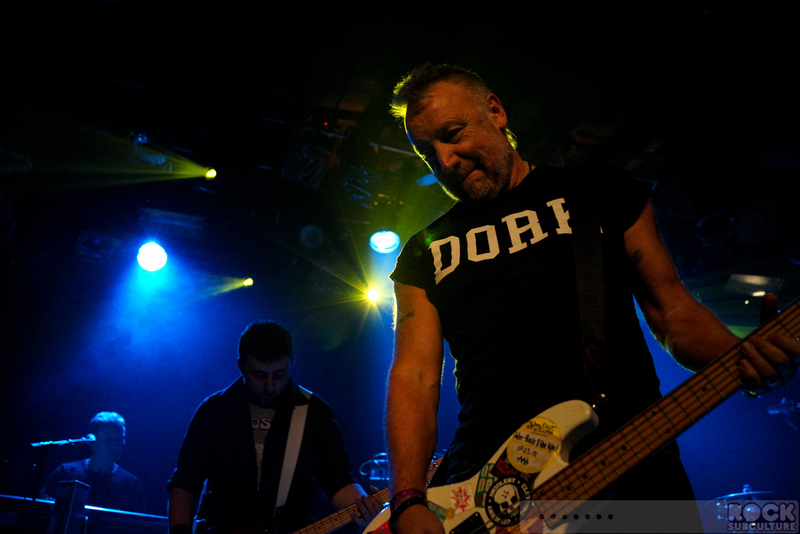 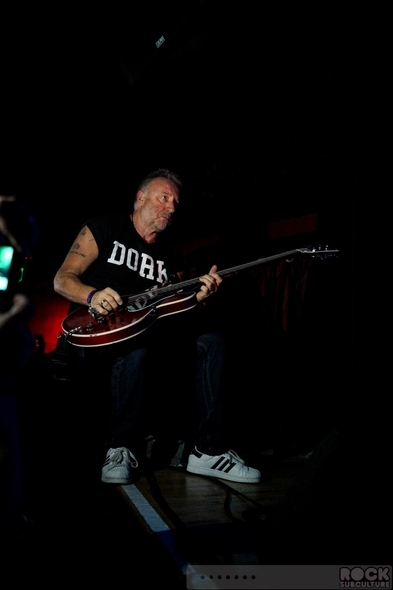 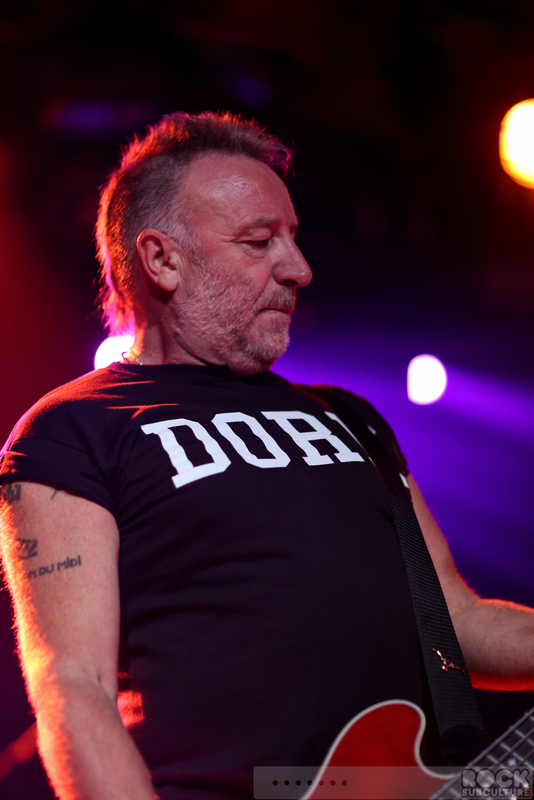 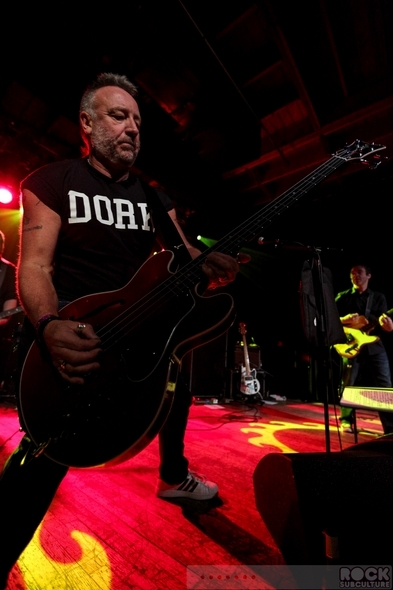 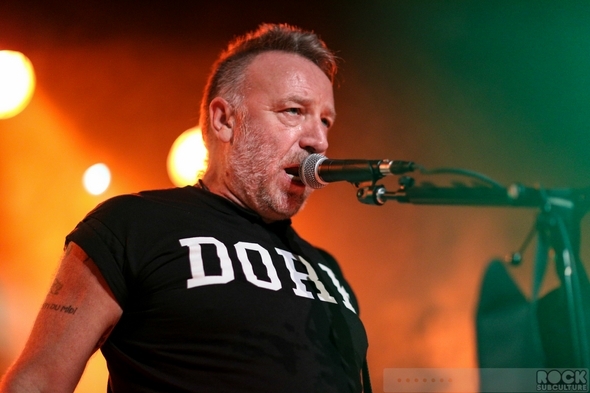 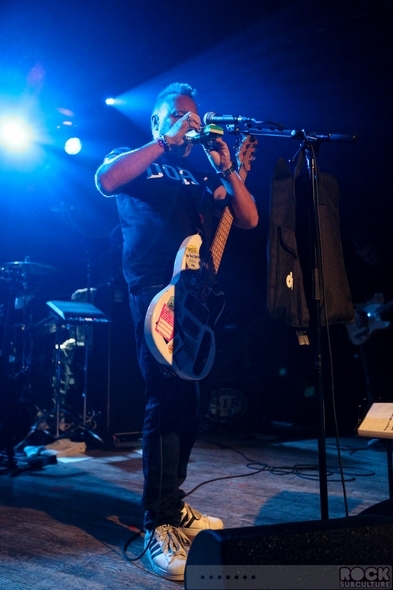 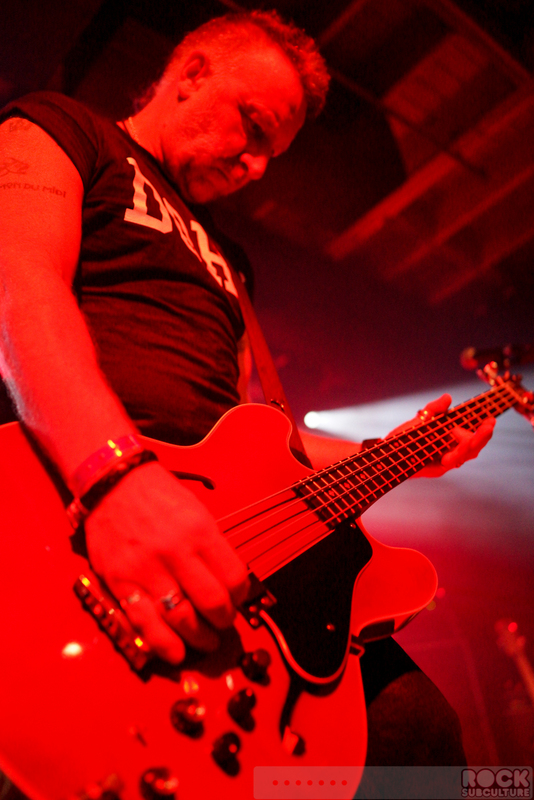 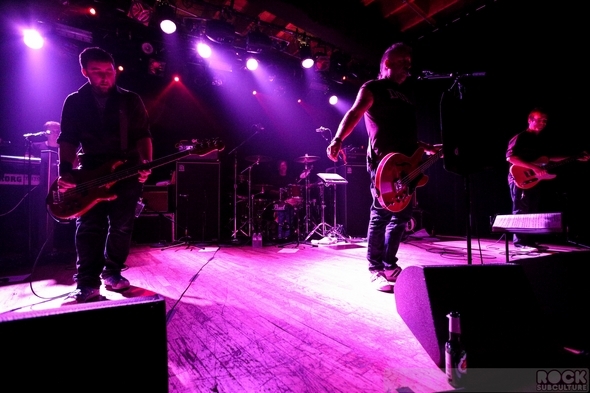 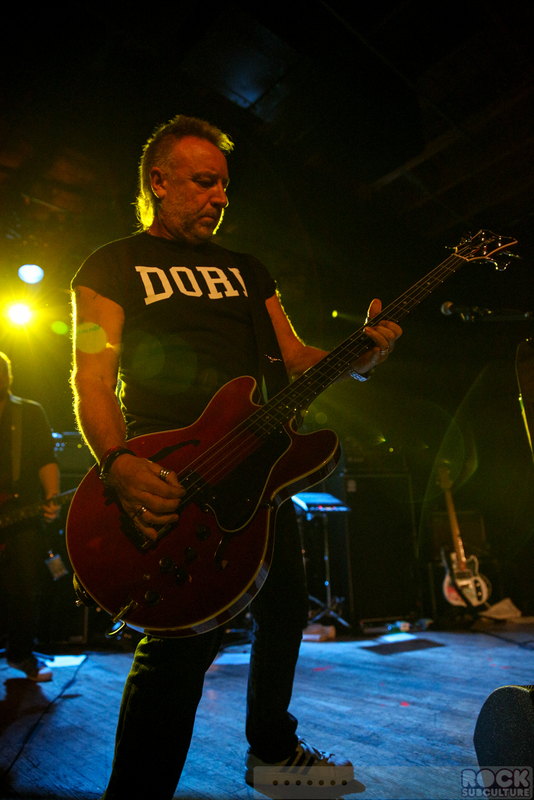 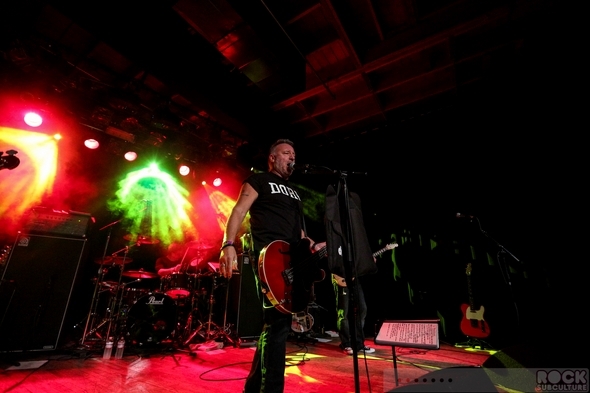 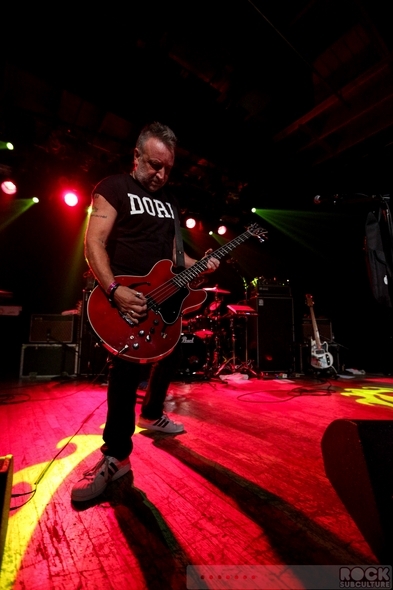 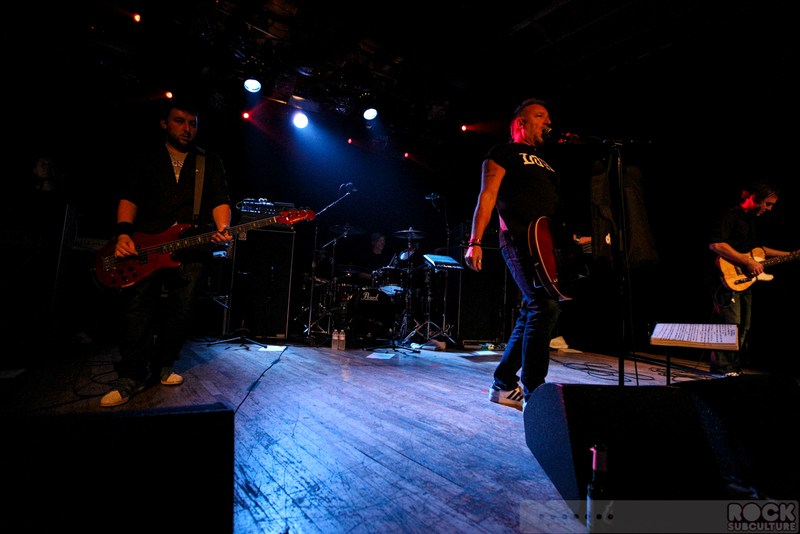 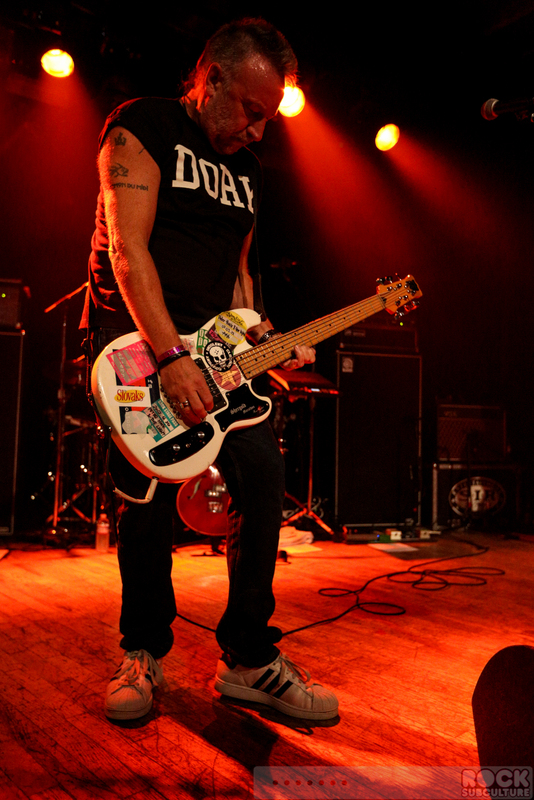 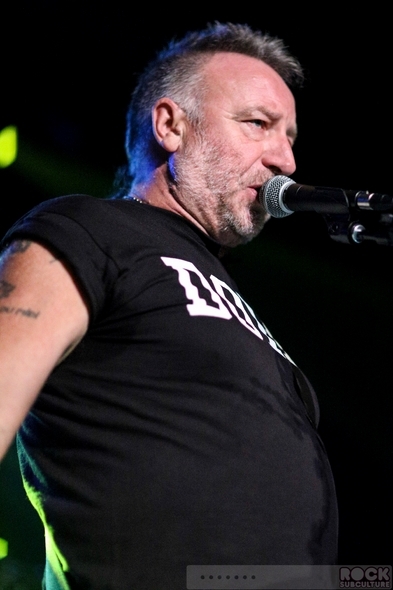 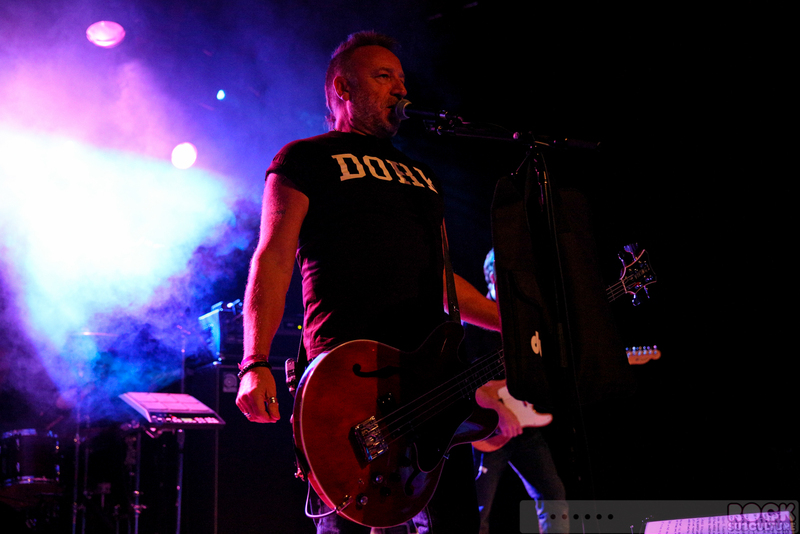 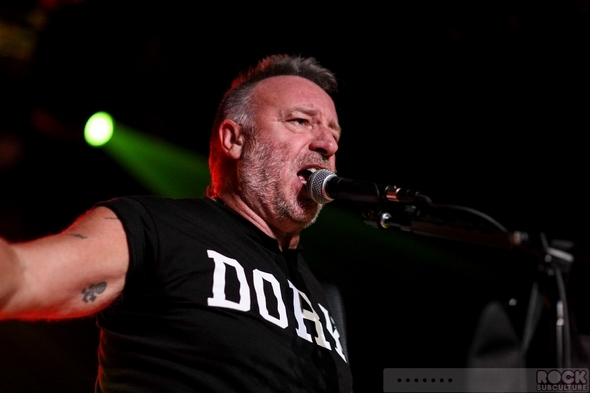 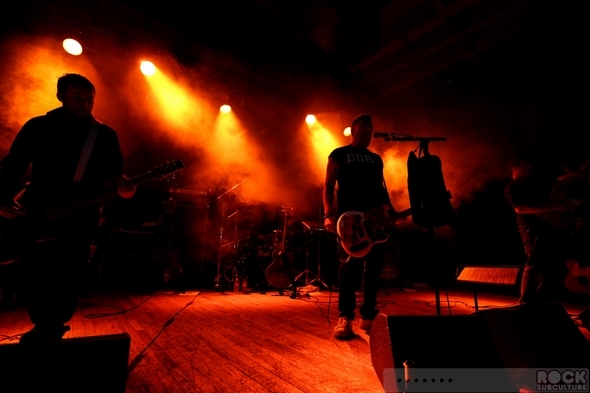 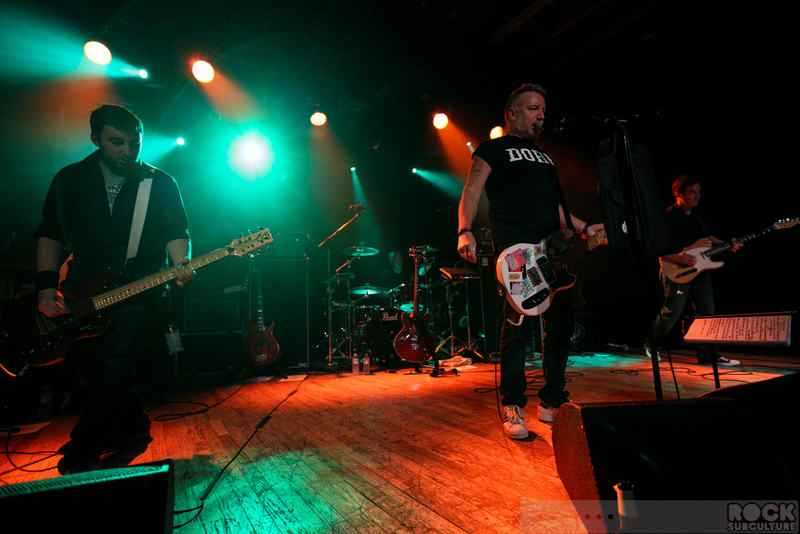 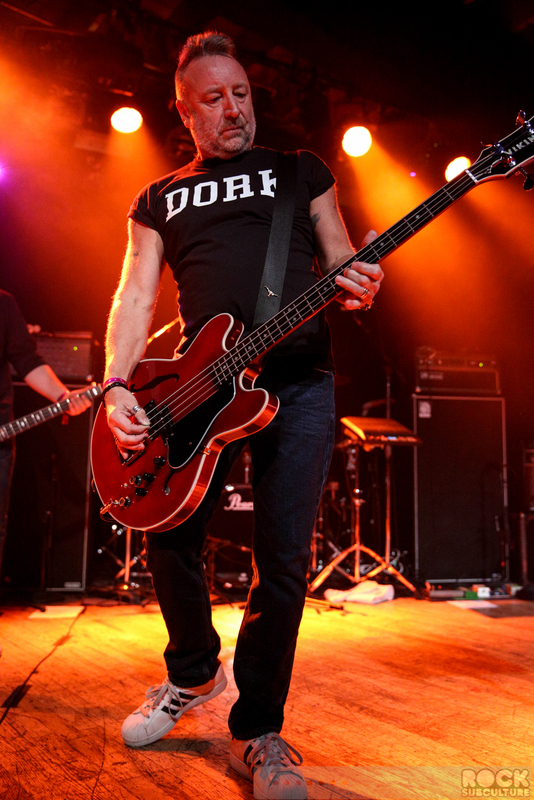 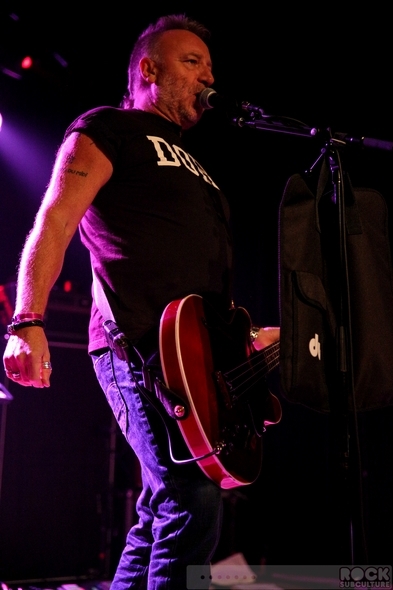 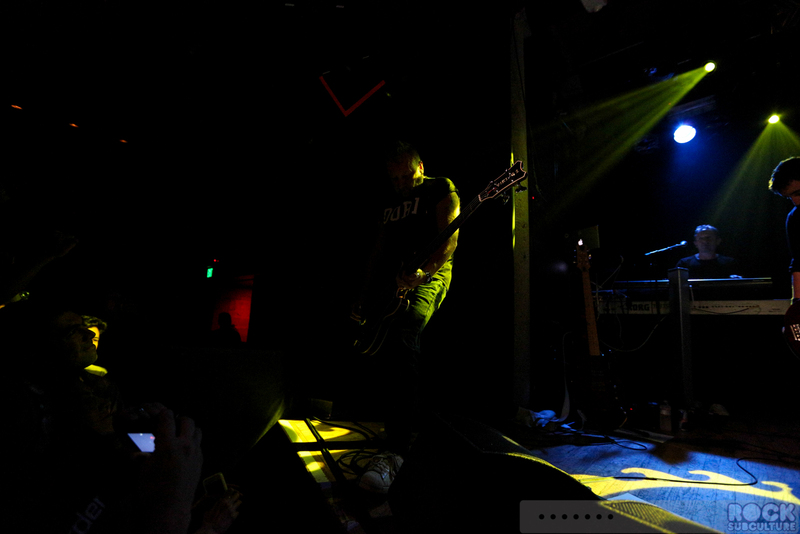 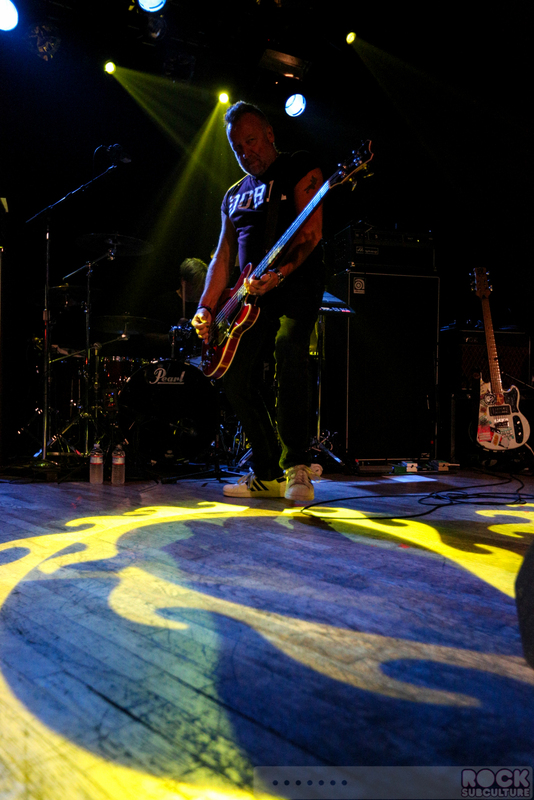 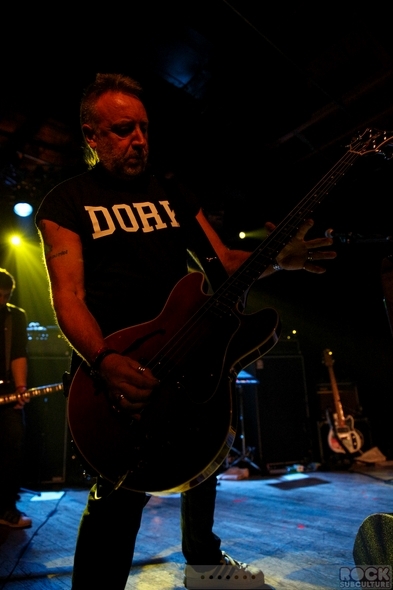 Peter Hook took center stage on vocals and with alternating bass guitars and one of three wardrobe changes of different colored tank tops with “DORK” emblazoned across the front of each. 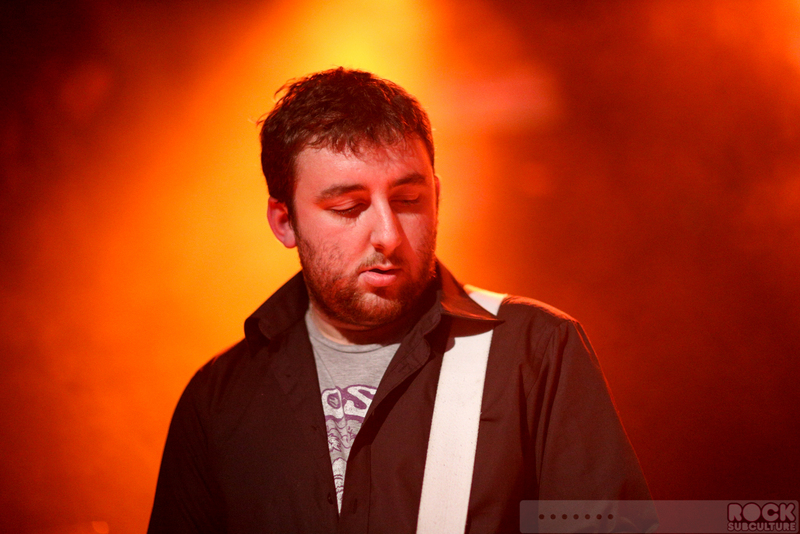 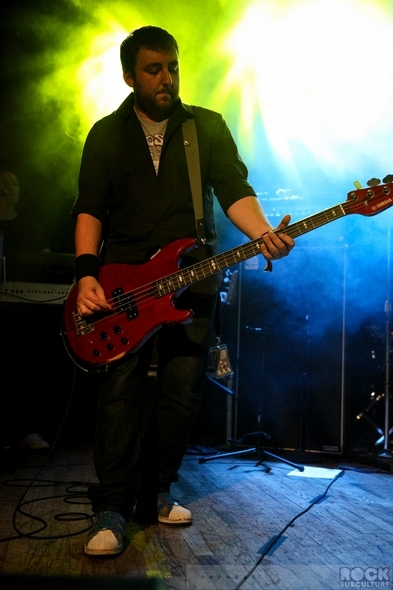 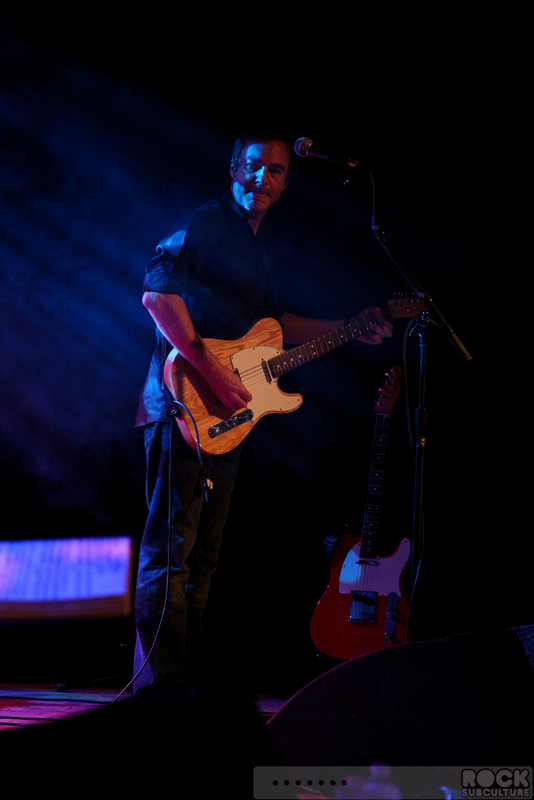 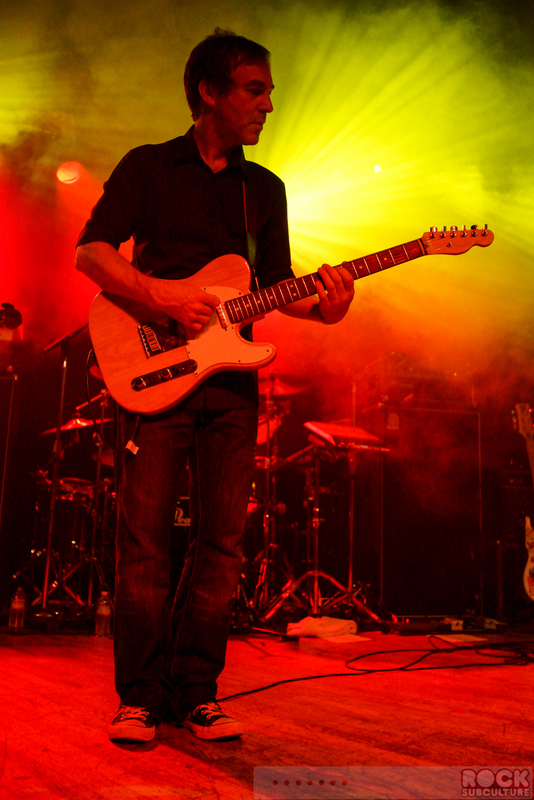 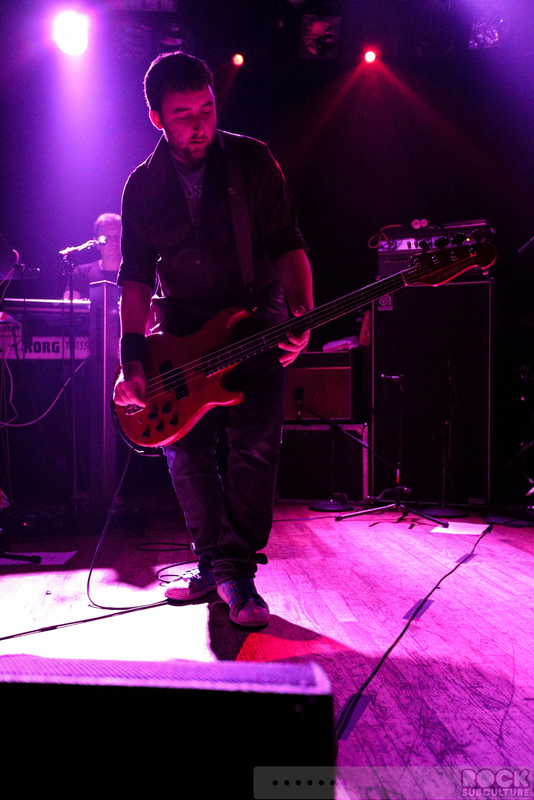 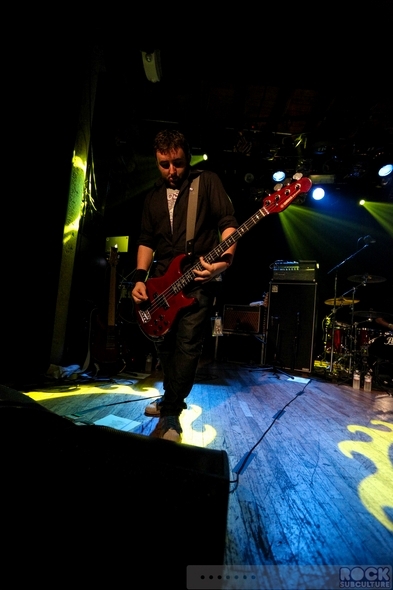 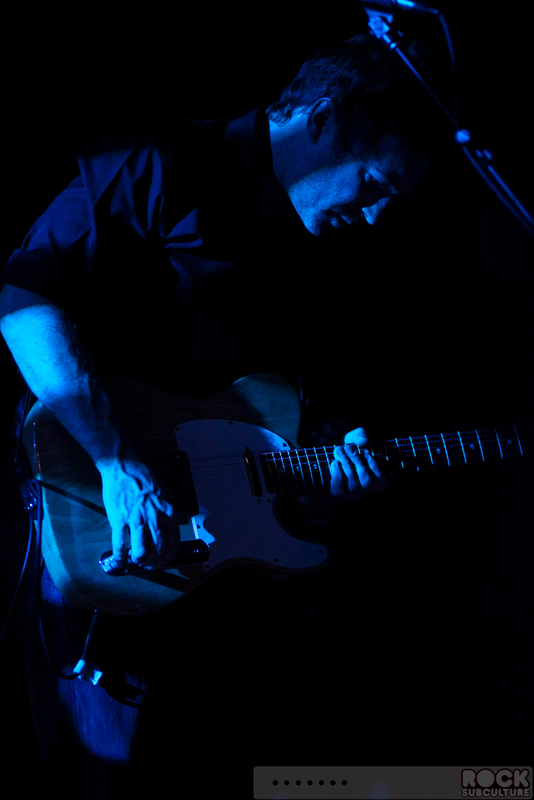 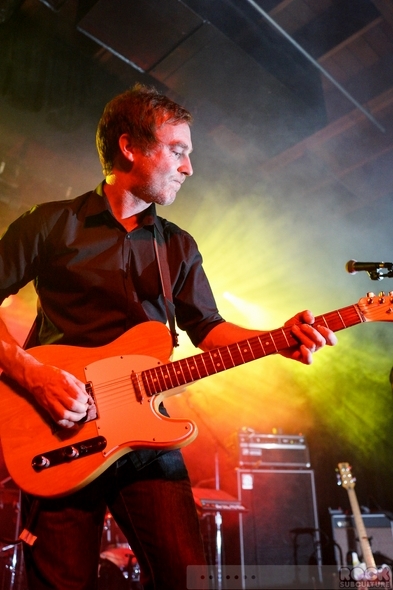 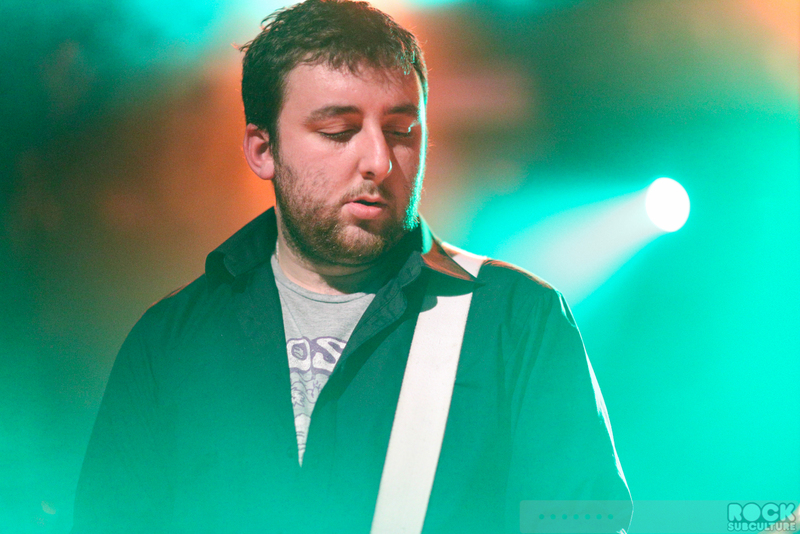 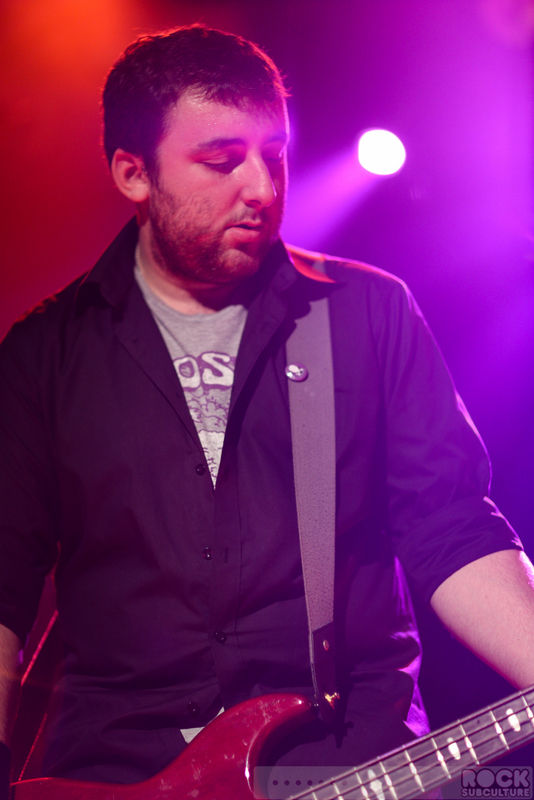 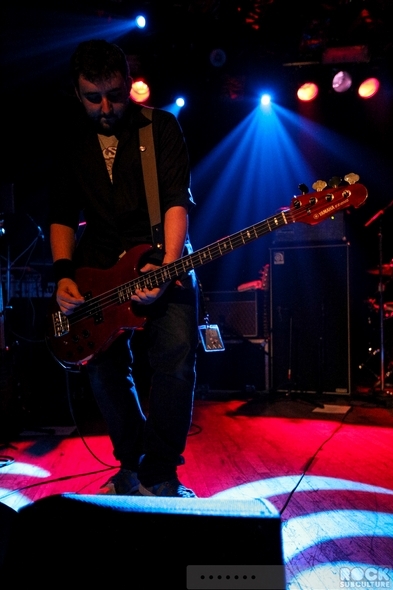 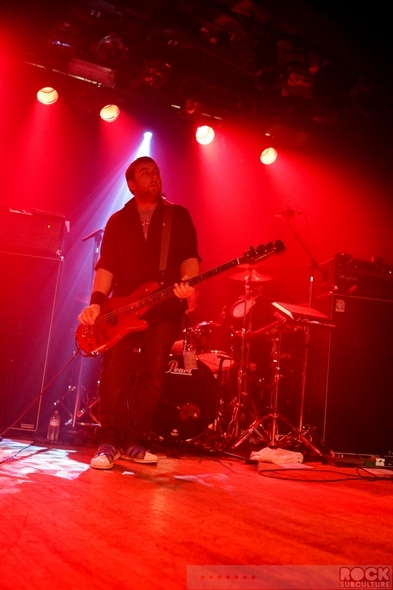 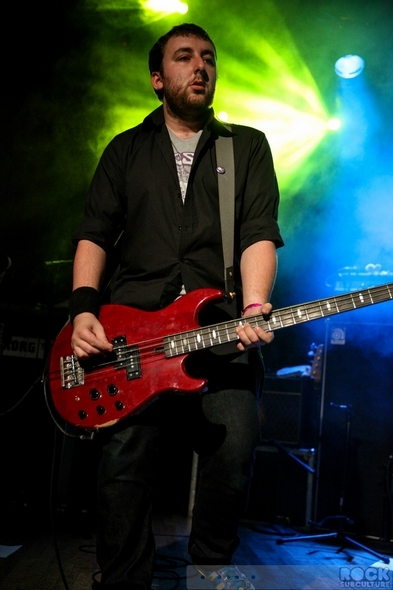 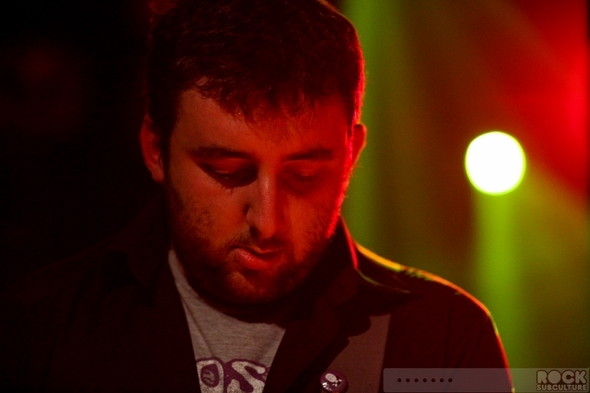 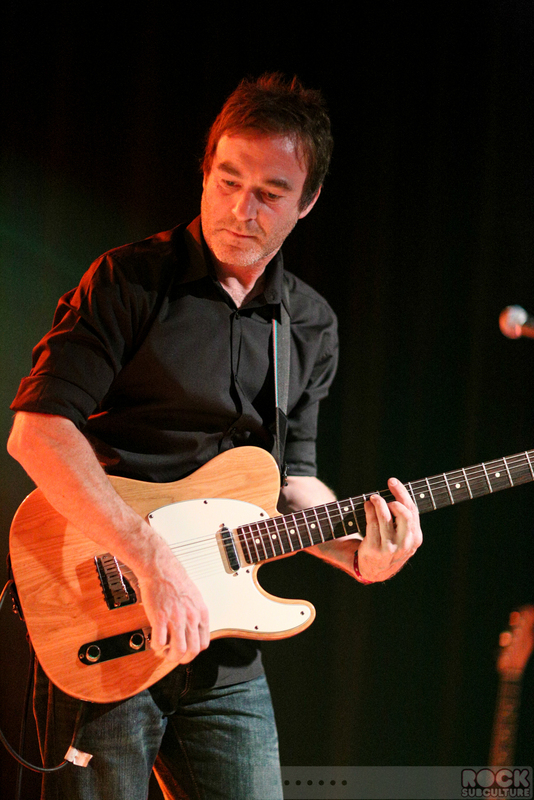 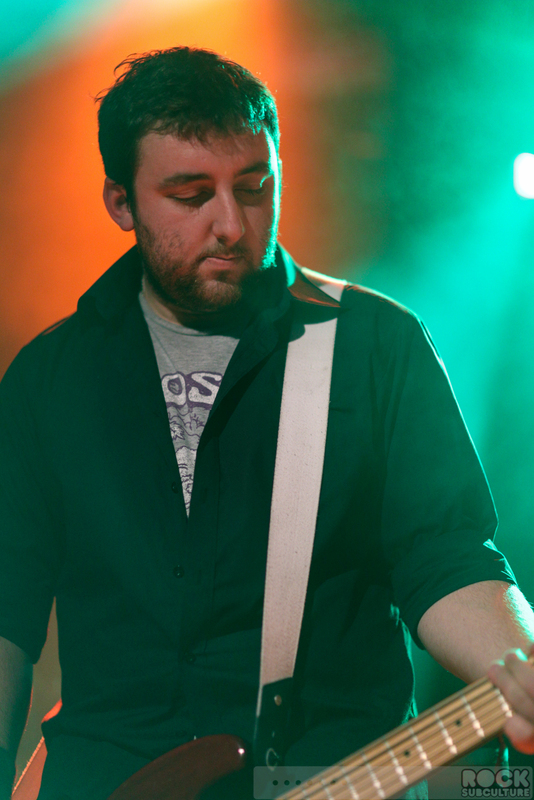 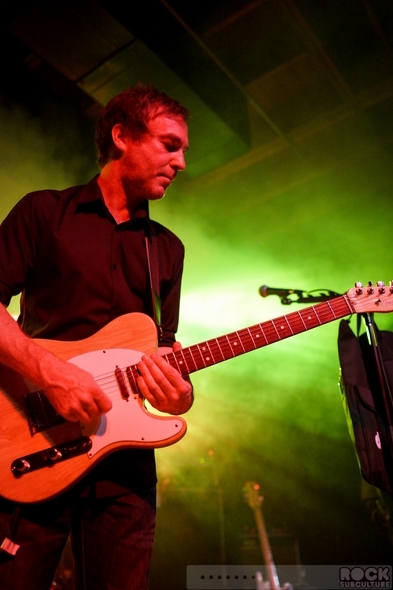 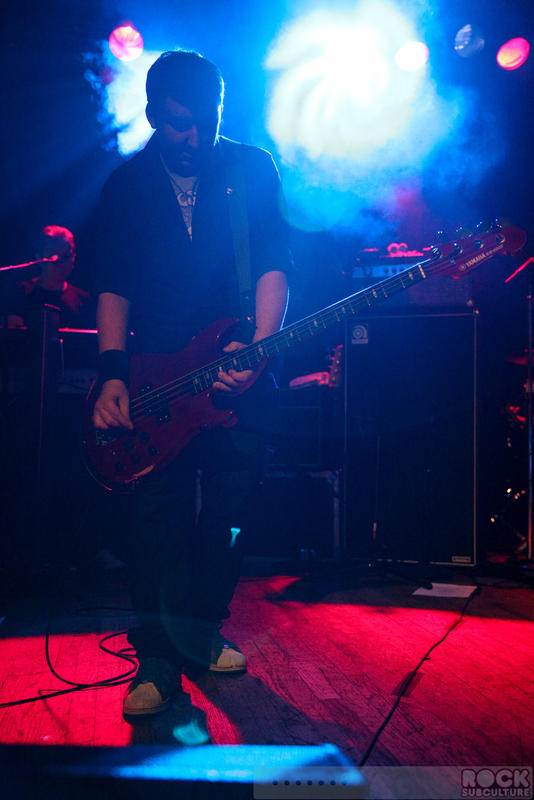 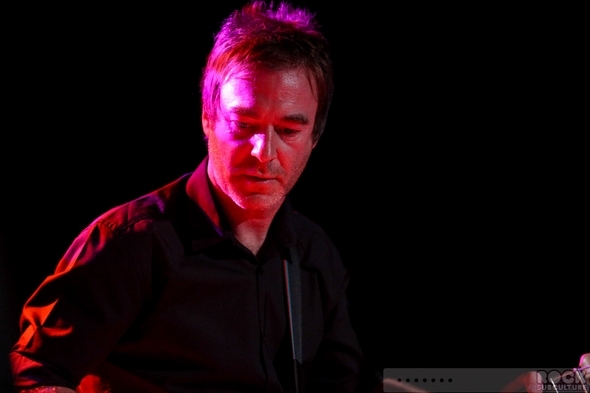 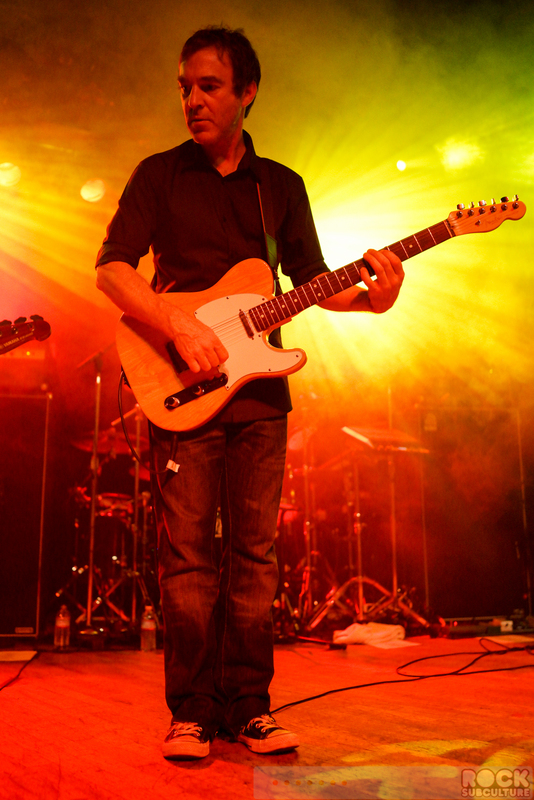 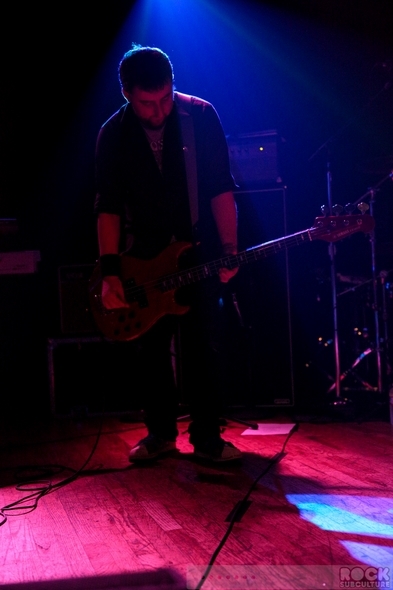 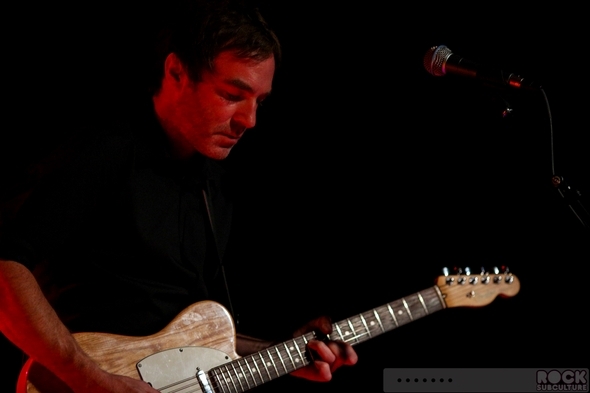 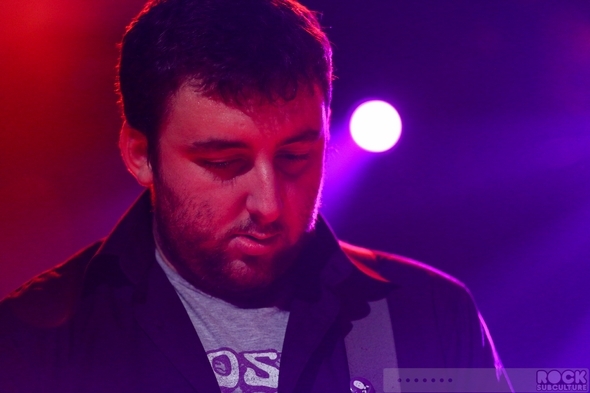 Hooky’s son, Jack, took the lead on bass on most of the songs. 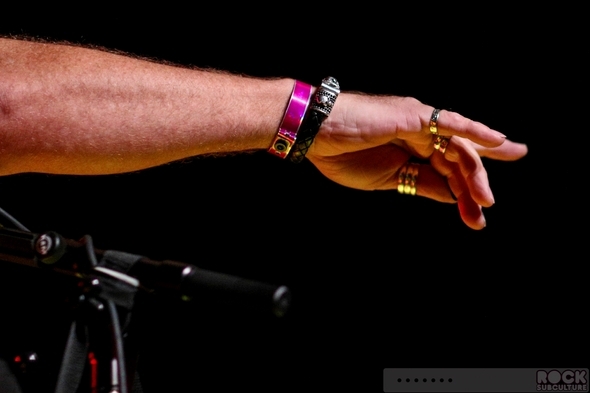 I’m always a little leery of musician’s kids following in their footsteps, as they frequently just don’t measure up. In this case, I was truly blown away at what a great bass player Jack is, even in comparison with his father. 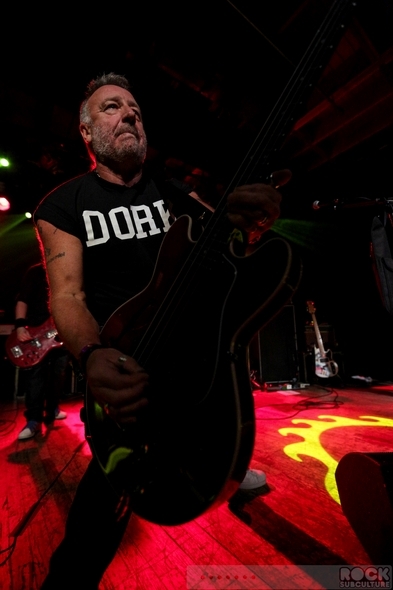 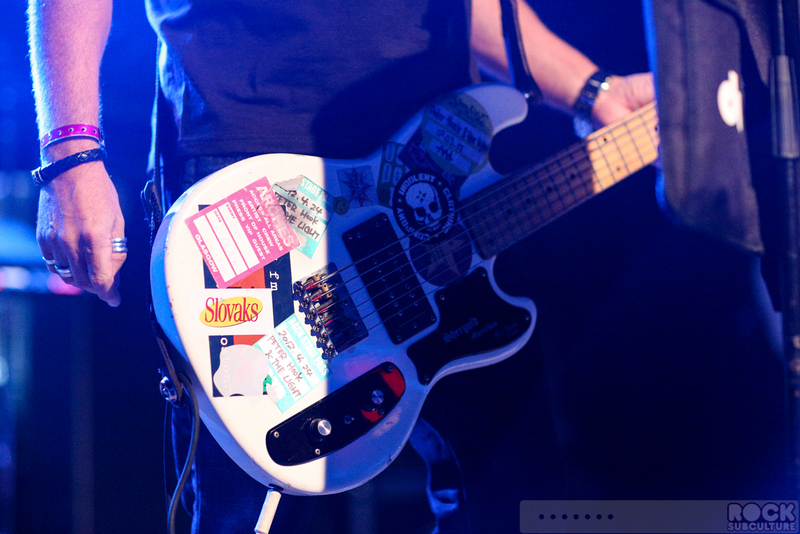 And to provide additional context, Peter Hook is far and away my all-time favorite bass player. 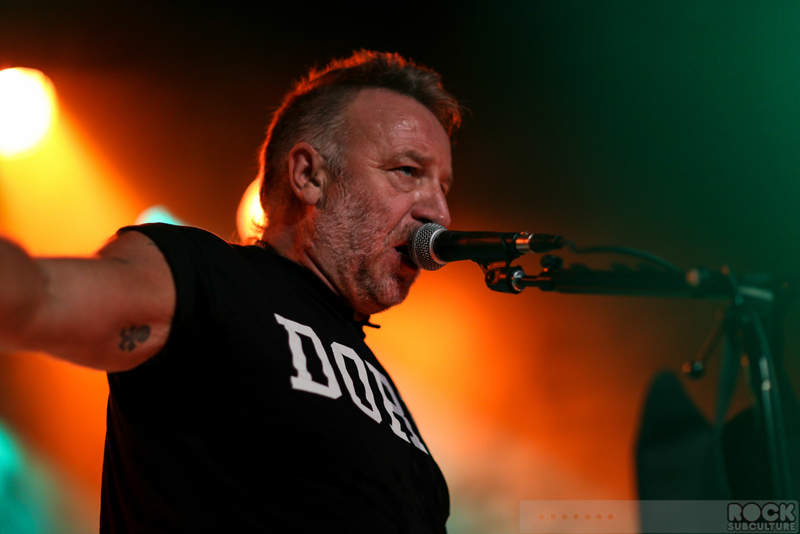 But standing just a few feet away, literally feeling the basslines pounding my chest, if I closed my eyes I would believe that it is Peter Hook throwing down… not his son. So this was another of the many surprises of the evening. 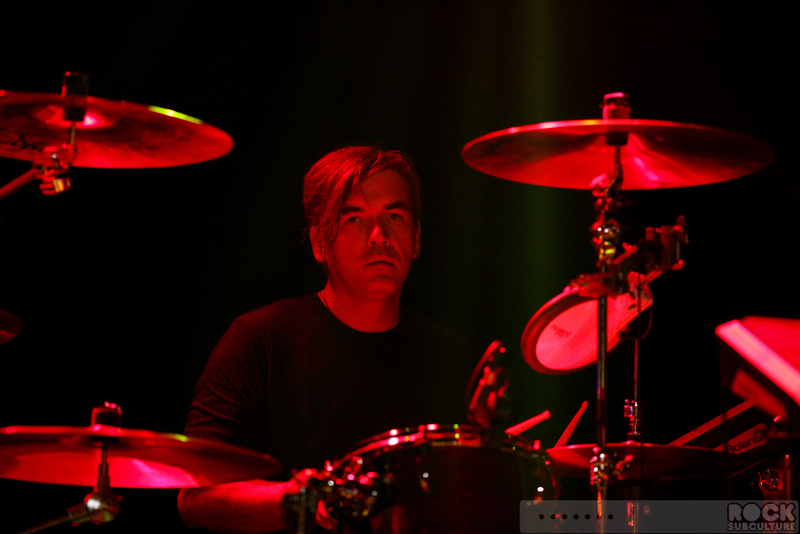 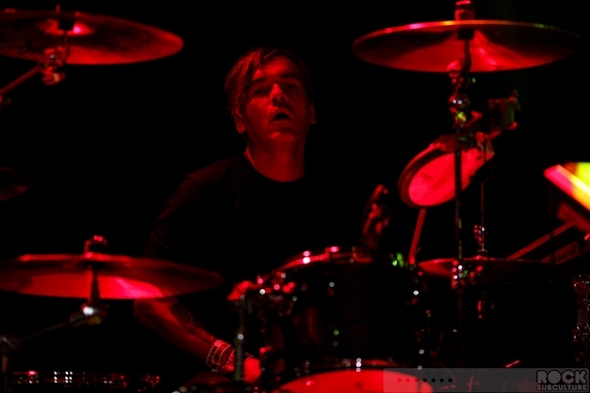 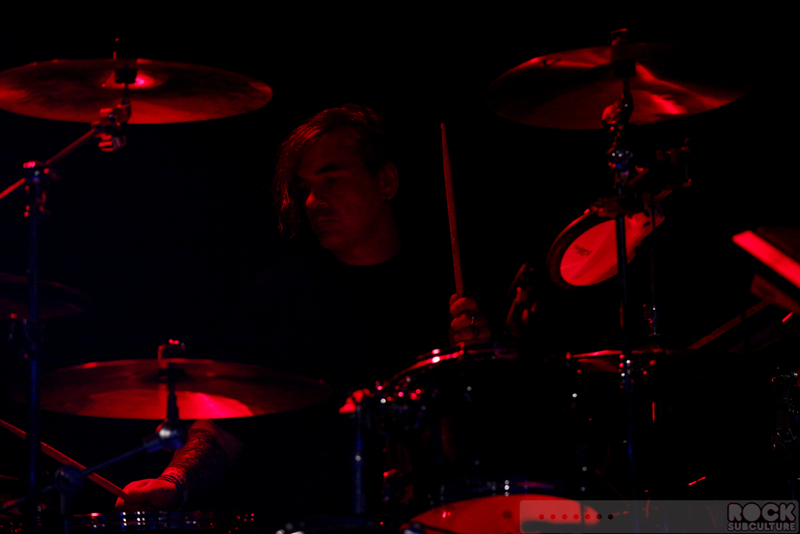 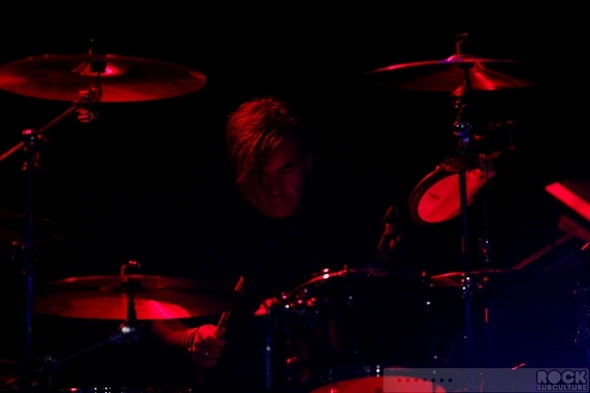 Paul Kehoe on drums was amazing. 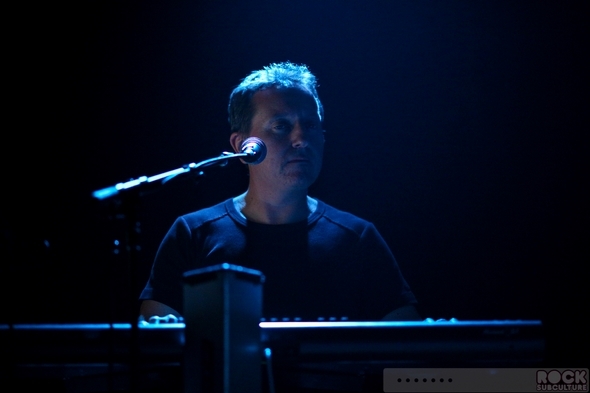 Given the variety of beats and types of drums used in both Joy Division and New Order – from traditional to electronic pads, Paul was driving each song masterfully with his work. 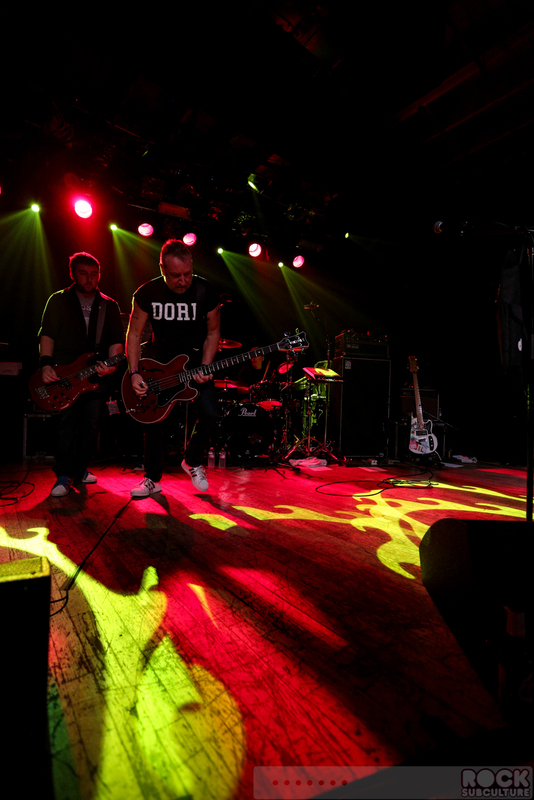 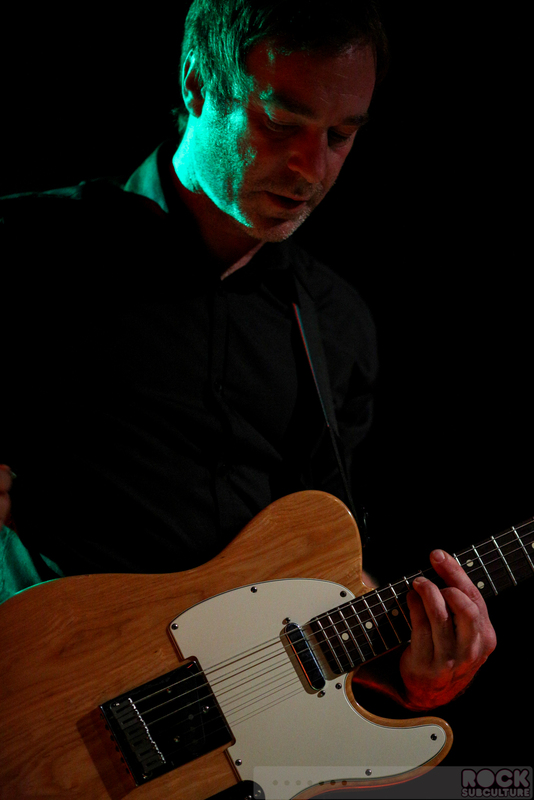 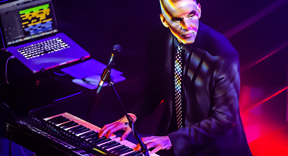 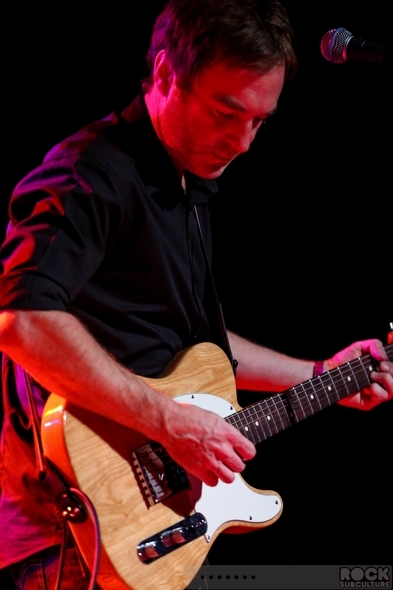 David Potts on guitar had flow and consistently weaved the riffs in and through each song with studio precision, while Andy Poole on keyboards obviously shouldered a lot of responsibility as the sole member on stage handling an expansive array of non-string sounds and beats. By way of providing some background and context into my own relationship with the music of Peter Hook and his former bands, as mentioned above, Peter Hook is my all-time favorite bass player. 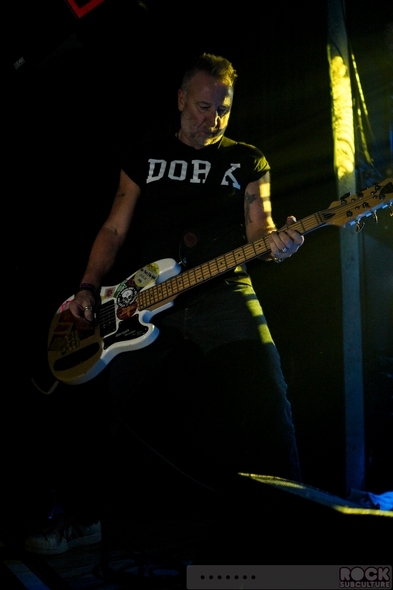 I think the man is a genius, and with many bands, the bass player is kind of lost in the sound, with nothing much to stand out within the songs (on stage or off). 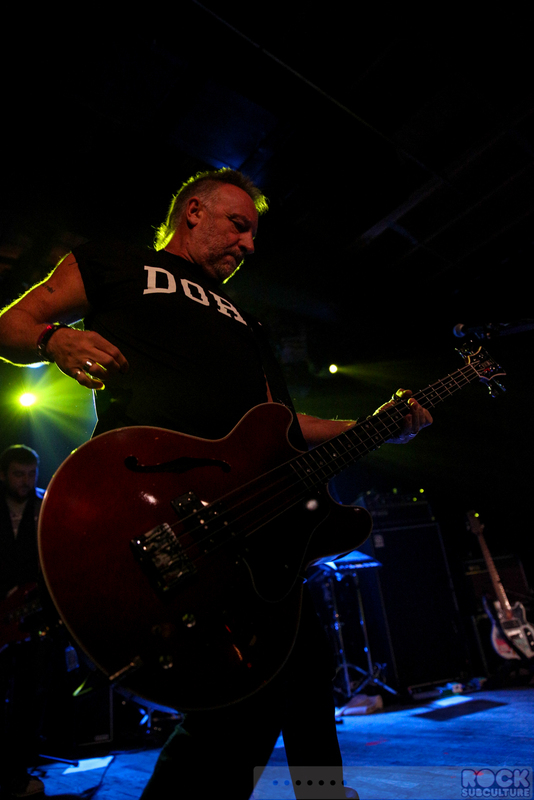 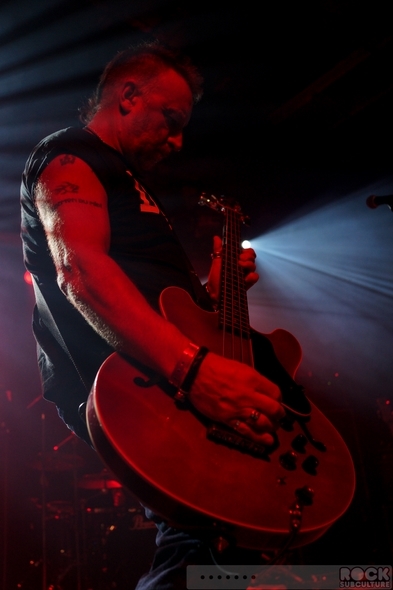 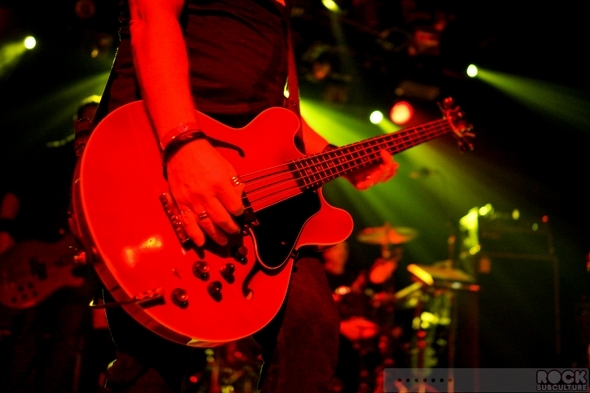 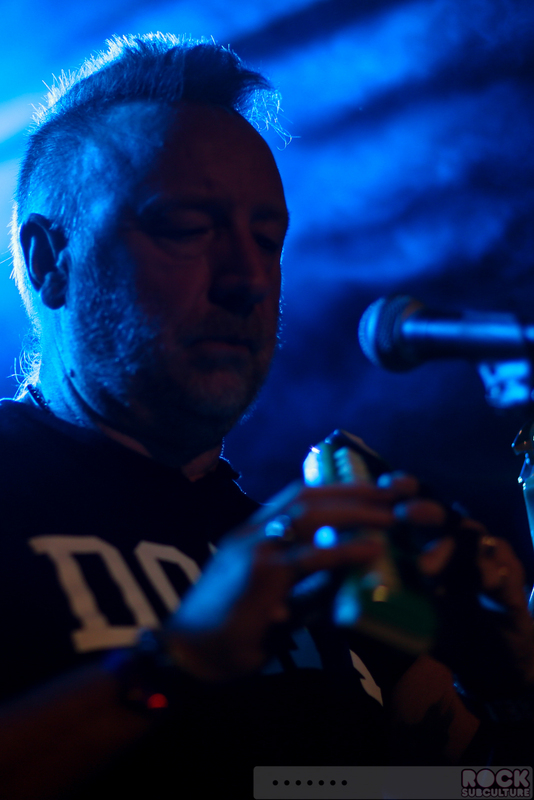 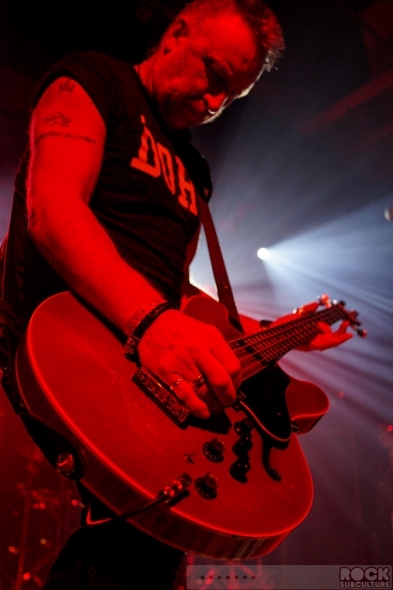 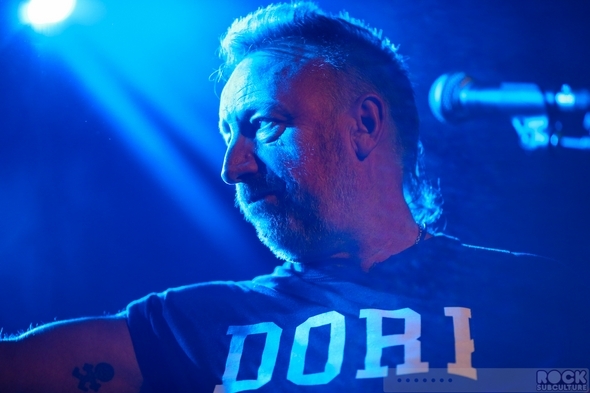 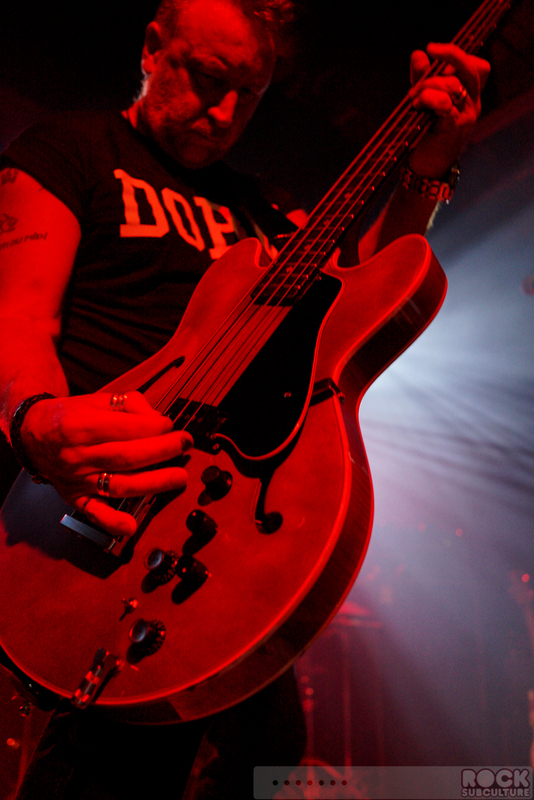 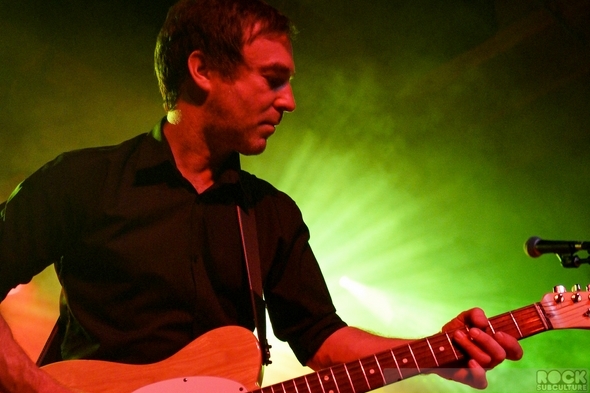 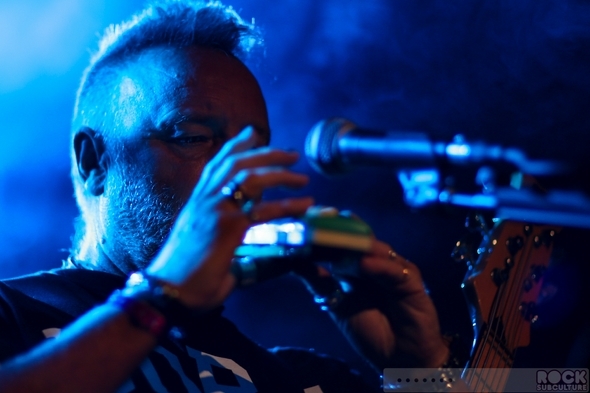 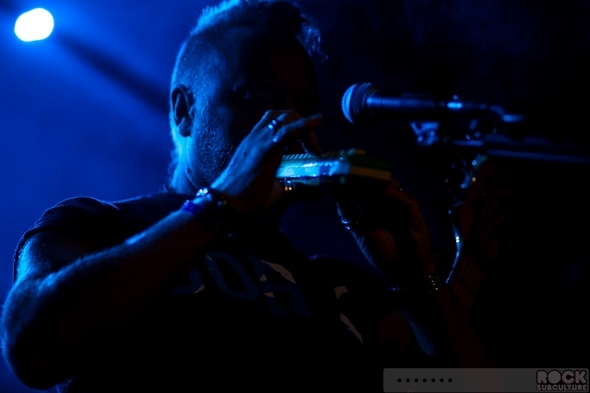 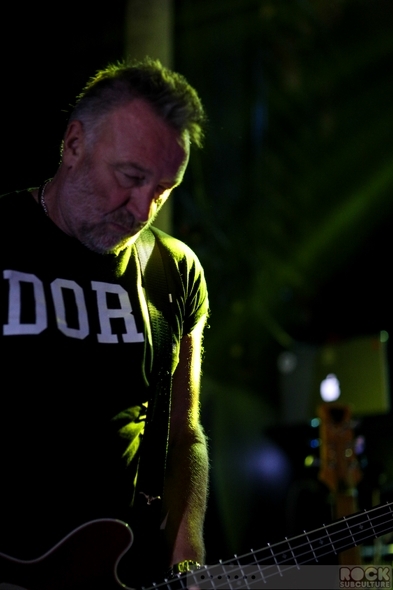 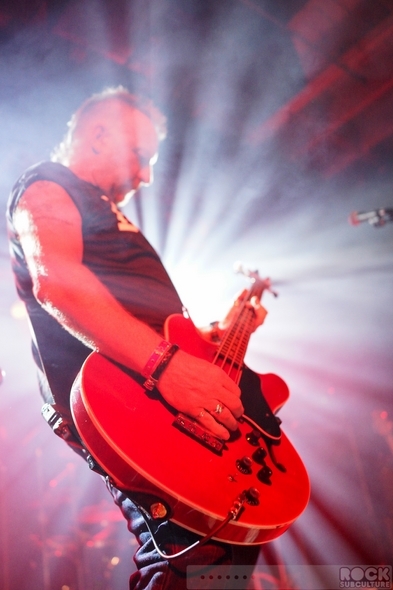 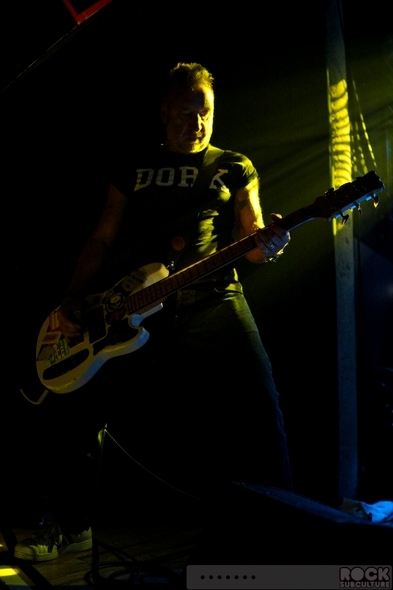 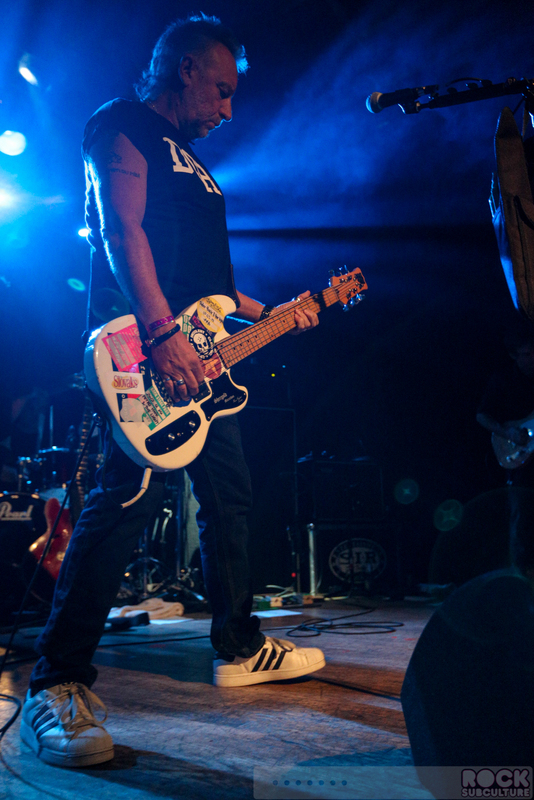 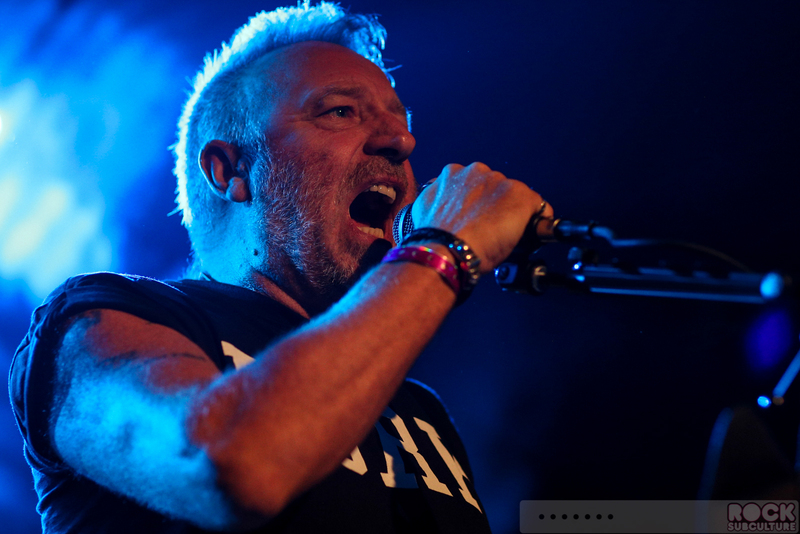 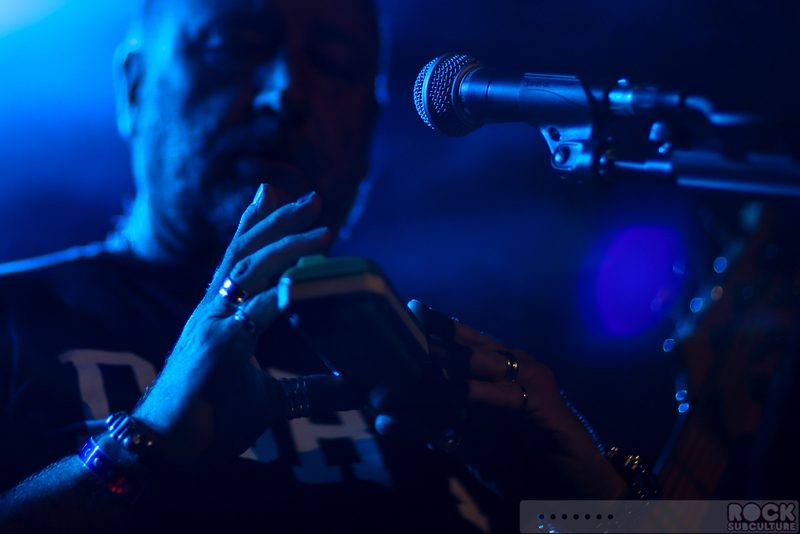 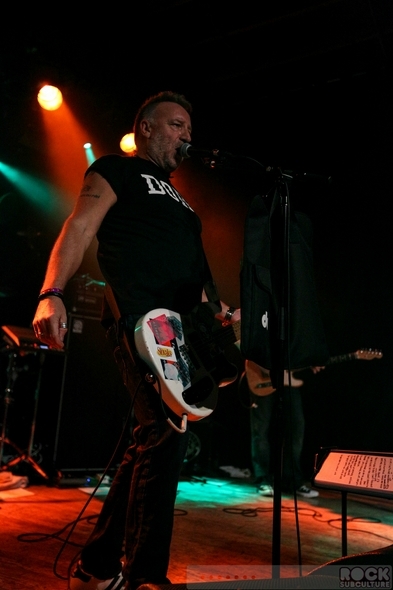 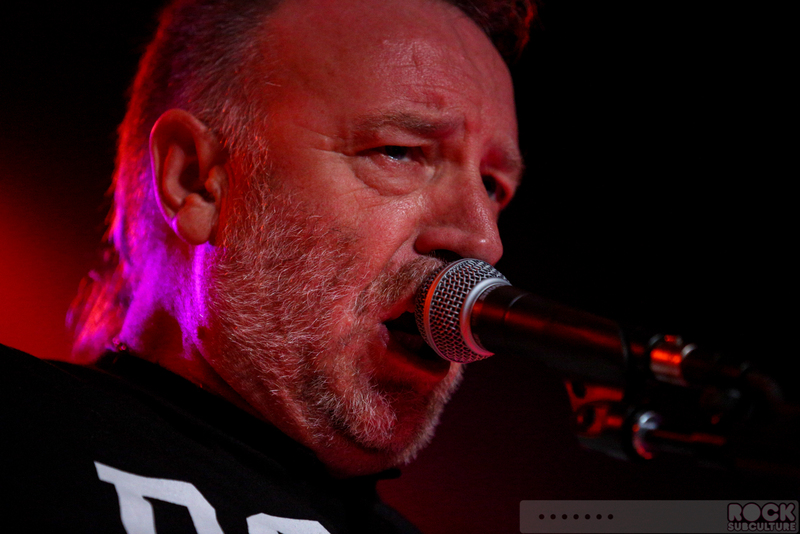 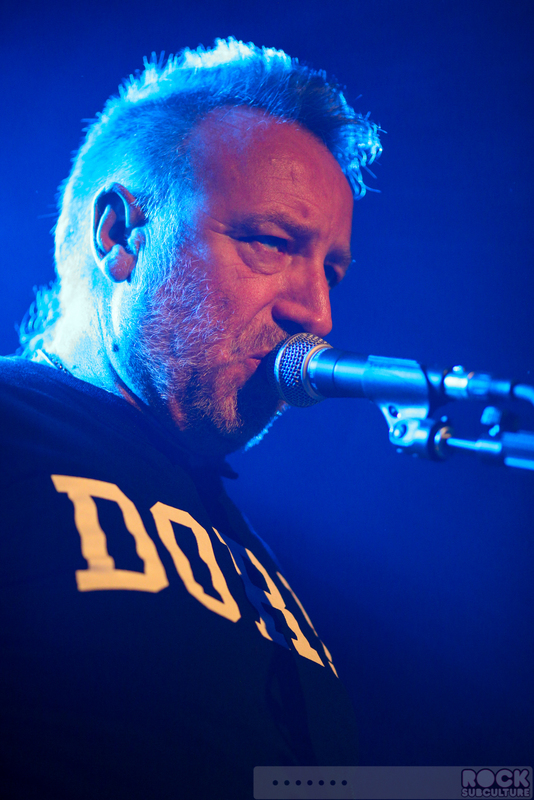 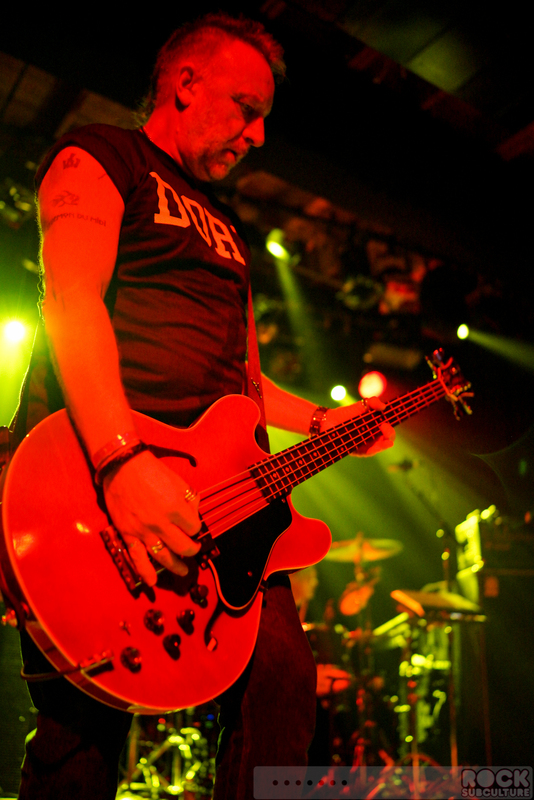 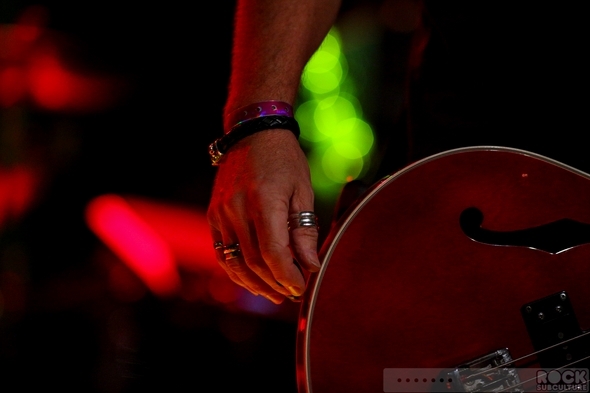 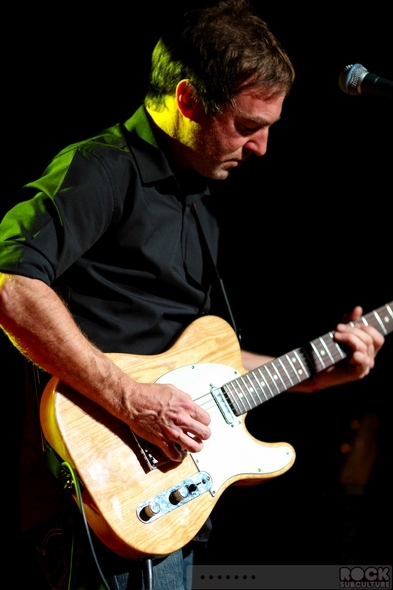 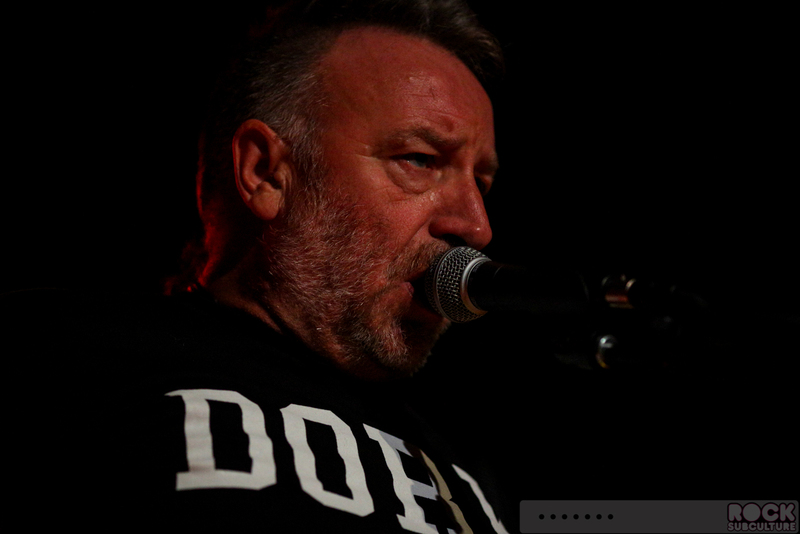 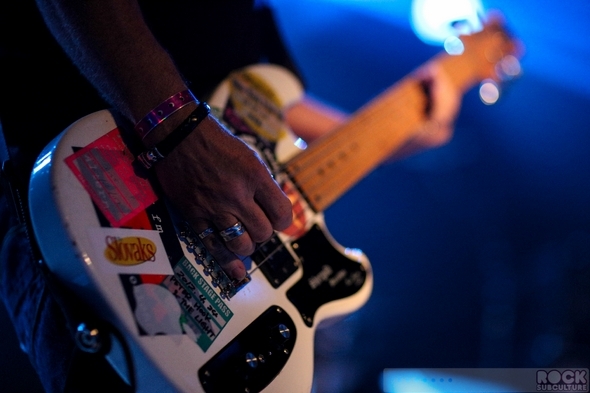 Peter Hook is about the opposite – not only is his work within each song integral, he has developed such a unique and distinct sound with the bass guitar that it is a singular style that is immediately identifiable. For many Joy Division and New Order songs, the lead guitar takes back seat to the basslines… the bass is just fundamental and key to all of that music. So while Peter Hook is my favorite bass player, I would rank New Order in my Top Five favorite bands of all time. I love Joy Division, but for me personally, it is the music of New Order that speaks to me and moves me. 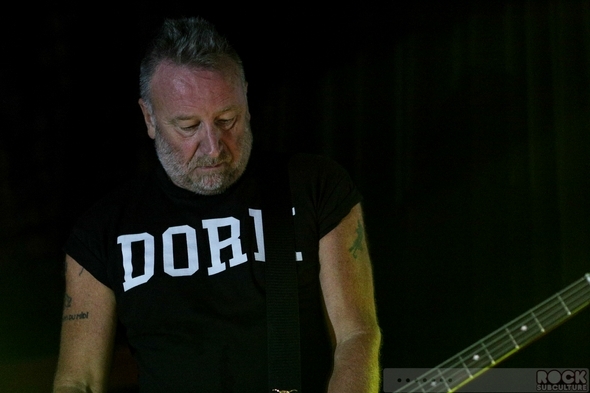 As explained in past reviews of the current touring formation of New Order (sans Peter Hook), I have been a huge New Order fan going back to the early 80s. 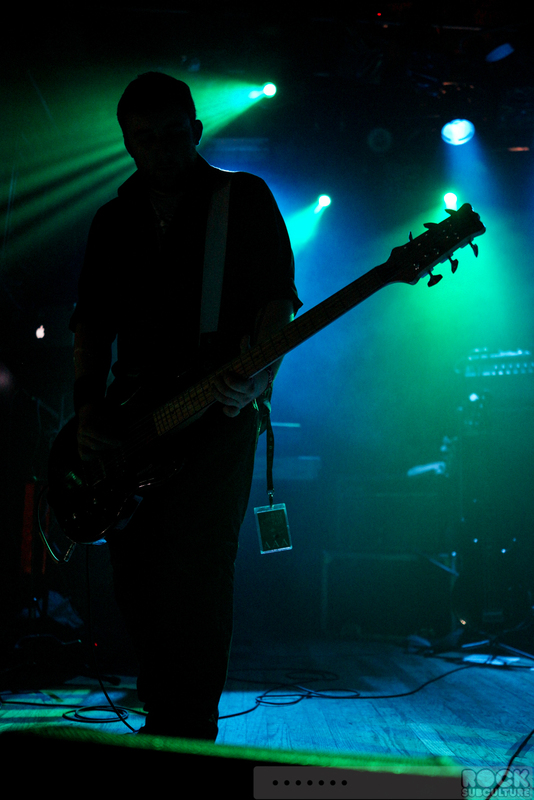 For those unfamiliar with the band, they were formed by the surviving members of Joy Division after the 1980 suicide of their lead singer, Ian Curtis. Bernard Sumner took over vocals, Stephen Morris and Peter (“Hooky”) Hook continued with bass an other instruments, and Gillian Gilbert joined the reformed band, which had a strong electronic pop change in direction from Joy Division’s post punk sound. 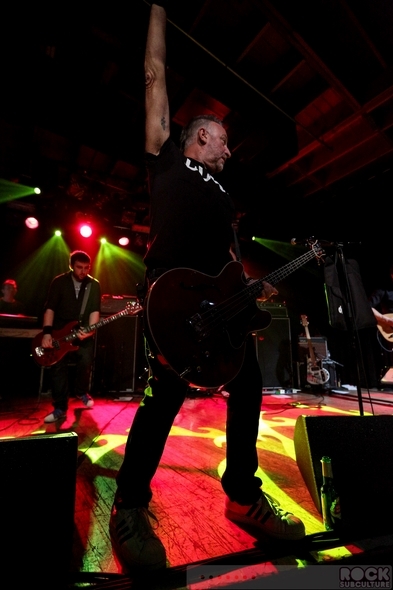 I did have an opportunity to catch the reformed (i.e. 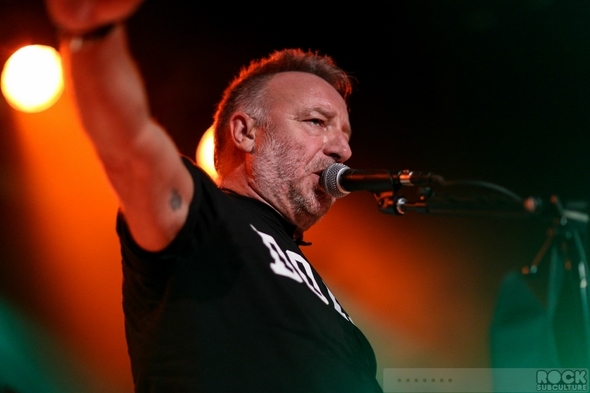 without Peter Hook) band play their first gig in England after an absence of five years at The Troxy in London in December 2011. 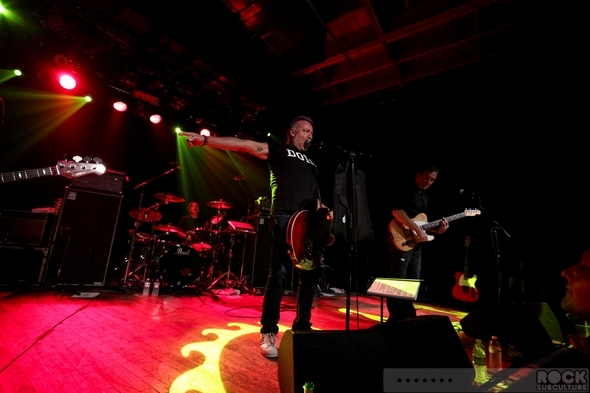 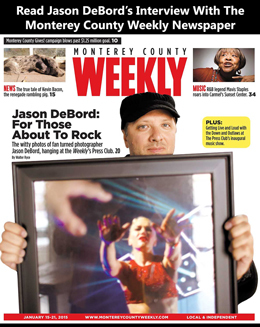 I’ve since seen them two additional times, once at The Greek in Los Angeles about a year ago and at The Cosmopolitan in Las Vegas earlier this year. 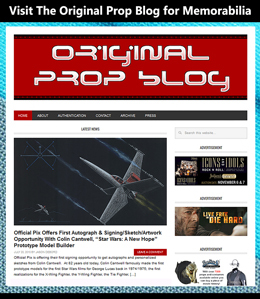 A lot of fans have been taking sides with one camp or the other in their dispute and parting of the ways… for me, it is not really for me to go down that path. 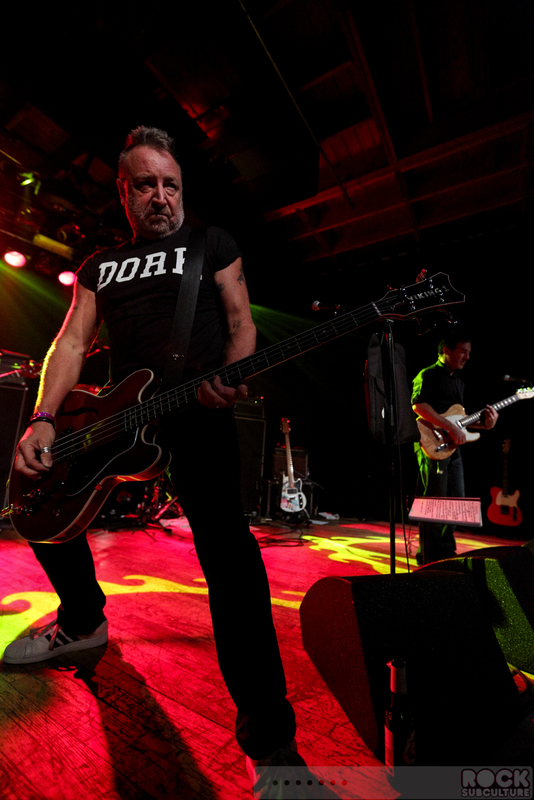 I love the band, New Order (the original) and all of the members are incredible artists in their own right. 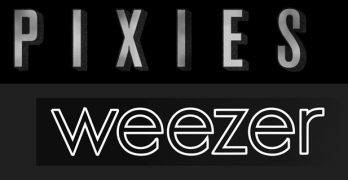 It is unfortunate that a series of events and personality conflicts have resulted in division, but if both parties are happy to continue on as they do and perform and make new music, my hope is to support them all, however their artistry manifests itself. 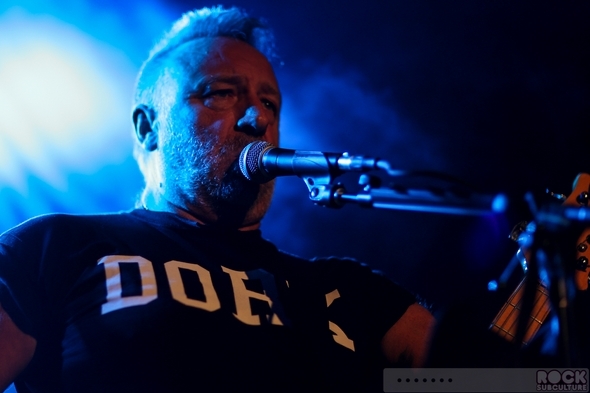 If I have an opportunity to see the current incarnation of New Order, I will; if I have a chance to see Peter Hook & The Light, I will turn out for their shows as well (and after last night, will make it a real priority to see them again soon, if possible). 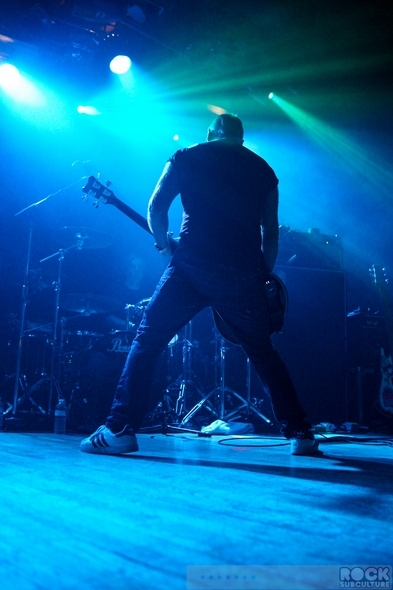 All that being said, having now seen both bands this year, I can’t help but to compare and contrast to some extent, as I found the respective bands have very different approaches to recreating their classic music. 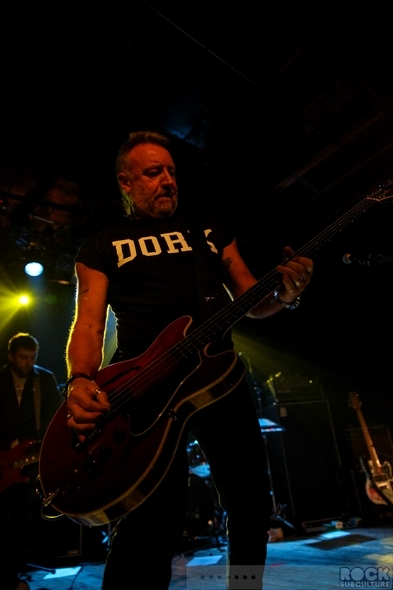 I feel like Peter Hook & The Light have more of a traditional “band” approach to the music, with more emphasis on the traditional rock band set up of guitar/bass/drums/vocals/keyboards, and thus better capture the spirit of the Joy Division material and early New Order material, while the current New Order is more geared toward the later New Order material. 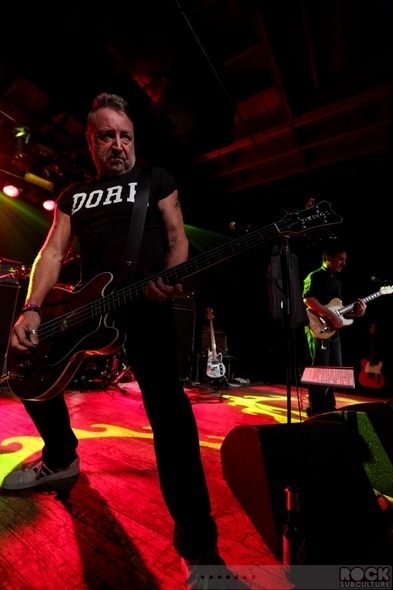 So the choice for Peter Hook and his band to tackle the first two New Order albums on this special tour seem to be a perfect choice to me, as that era perfectly matches their band. 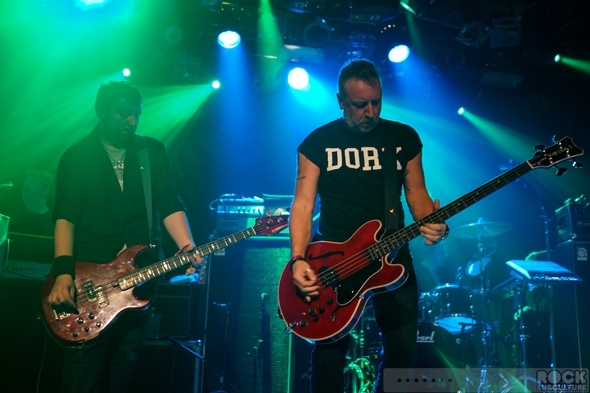 Taking in the show, I could imagine that this is what it might have felt like hearing the original New Order playing that material back in the day. 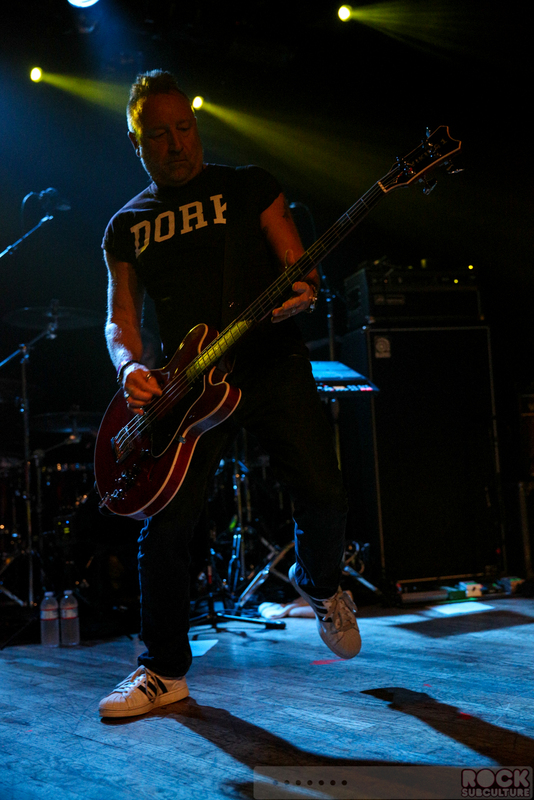 More organic and authentic to the time. Listening to the actual studio albums of Movement and Power, Corruption & Lies, you can hear the reformed Joy Division finding themselves… exploring, taking on a new approach and outlook not only on music, but on life. 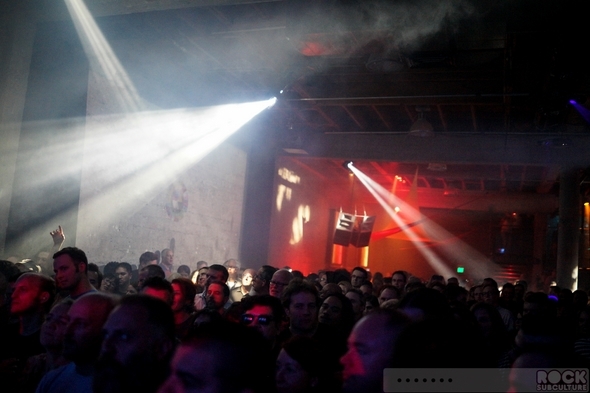 In the throws of tragedy, somehow finding some joy and optimism. 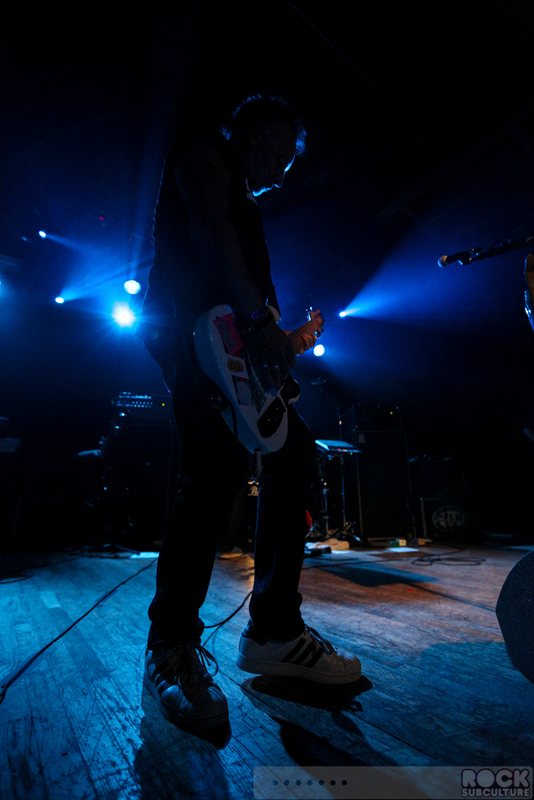 Maybe living in the moment. 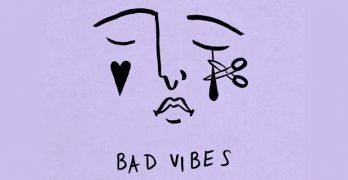 You can see this even song to song. 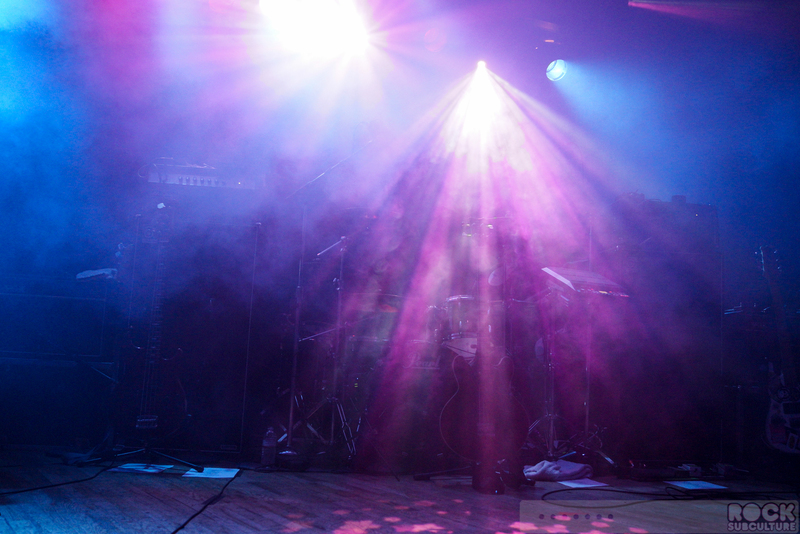 Movement does not diverge too much from Joy Division, but Power, Corruption & Lies does quite drastically. Once you get to “The Village”, with lines like “our love is like the flowers”… decidedly not very Joy Division-like. 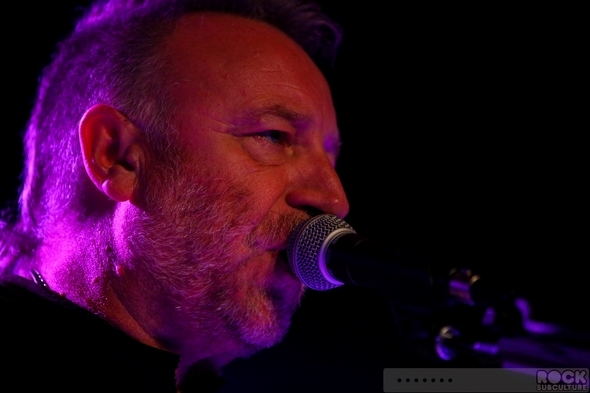 And “5 8 6” is so electronic and goes through drastic changes, it is kind of the prototype New Order song, while “Blue Monday” was and remains the ultimate New Order song (and one of my favorite songs of all time from any artist). 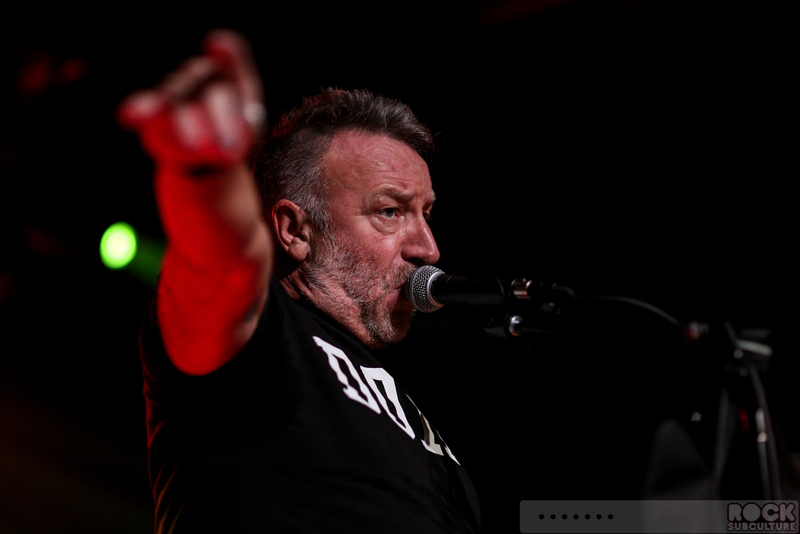 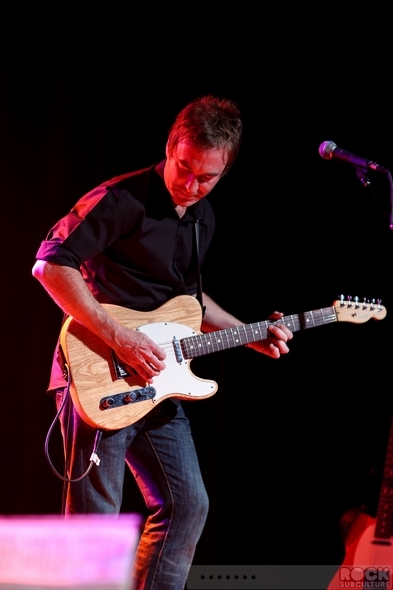 “5 8 6” is also one of the first songs where Barney found his own voice and vocal style that really became a signature for the band to counterbalance Hooky’s bass for all of the albums that followed. 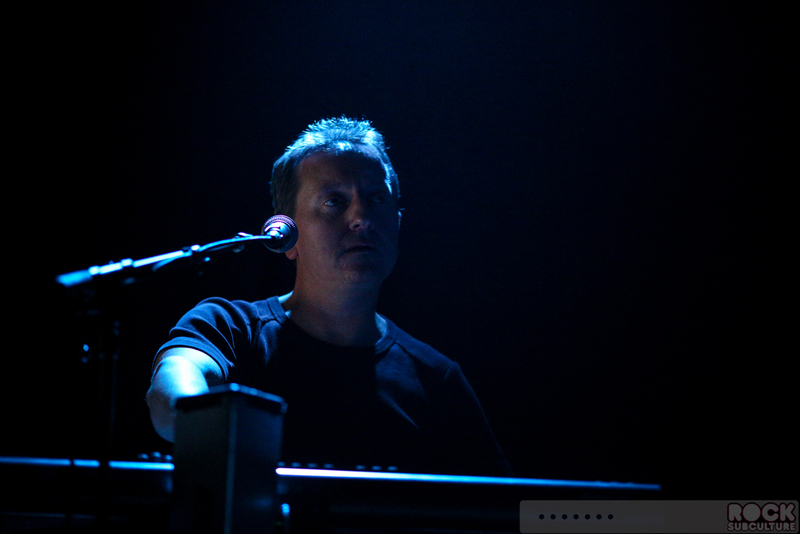 As an aside, I think as they transitioned from Joy Division to New Order, the songs, lyrically, became more about mood than meaning. 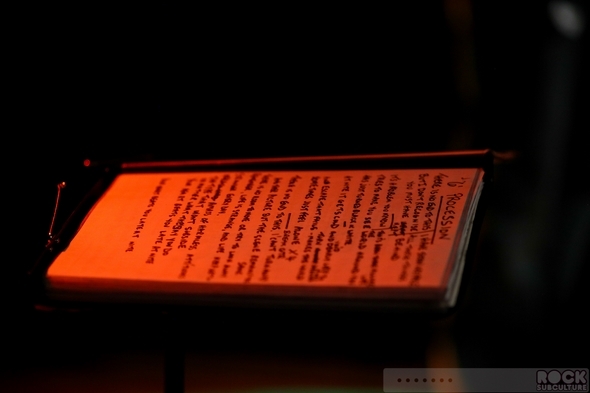 As the songs got happier, for lack of a better descriptor, they became more poetic and abstract with the words. So all in all, for me, Peter Hook & The Light seem best suited to recreate the music of Joy Division and, funny enough, these two first albums by New Order, while the current incarnation of New Order in my opinion are maybe preferable for the more contemporary works of New Order. 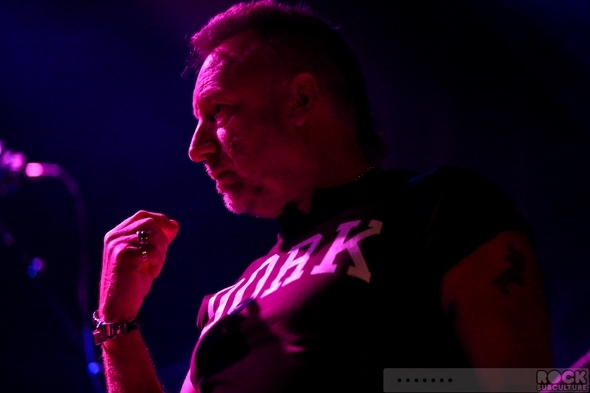 And more or less, that seems to be what is happening with their respective touring efforts, so maybe that is consistent with their own feelings on their works? 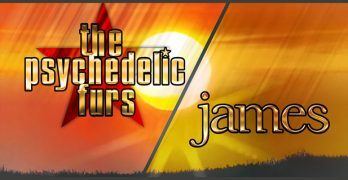 As mentioned in the past, my dream is to someday hear one of these groups play “Fine Time”, “Round and Round”, and “Mr. 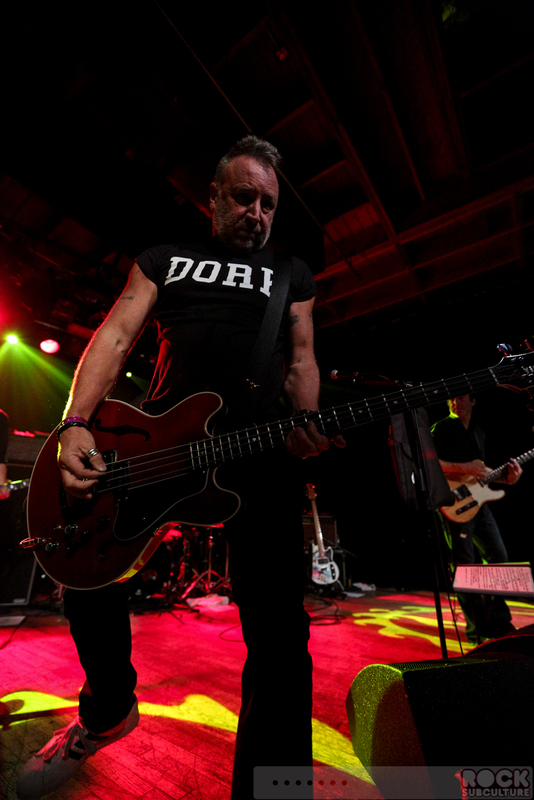 Disco” – currently (as far as I’ve tracked, anyway), neither band seems interested in doing anything from Technique, which aside from the Substance, is my favorite New Order album (and the one I’d rate as representative of them at “the top of their powers”, so to say). 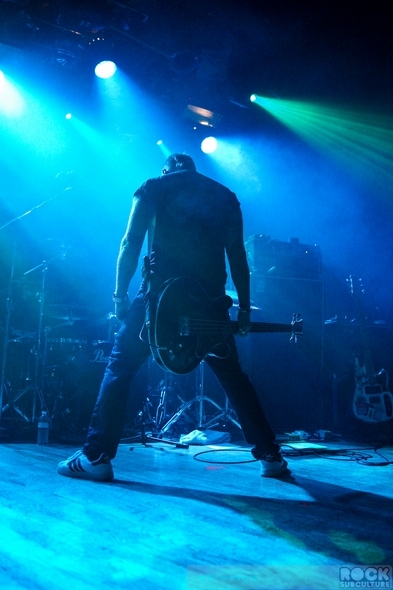 Having spent my formative youth growing up in the 80s, I would rate Substance as one of my top five favorite albums of all time (though it is a compilation album). While New Order has been touring with some cool electronic images screening behind them (kind of in the spirit of the work done for them by Peter Saville), Peter Hook & The Light are all about less is more, I think, with fantastic lighting and the music itself sending the crowd into a frenzy. They were literally bathed in light, which created awesome atmospherics. Peter Hook’s reputation kind of precedes him, but I came away from the night feeling that reputation doesn’t quite fit the man I watched on stage from a few short feet away. 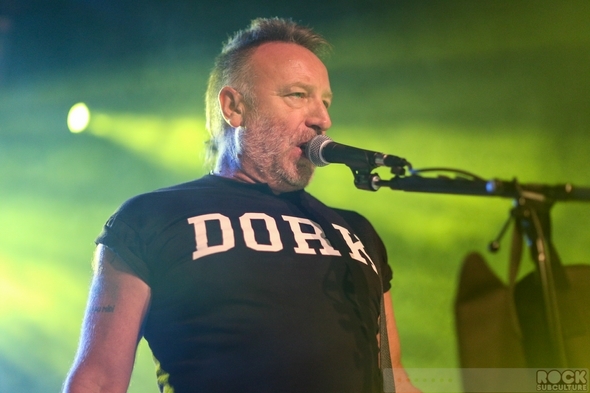 He is self-deprecating (by way of his three wardrobe changes to three different colors of tank tops with “DORK” emblazoned across the front in bold, black letters”), humorous, and most definitely a caring man. 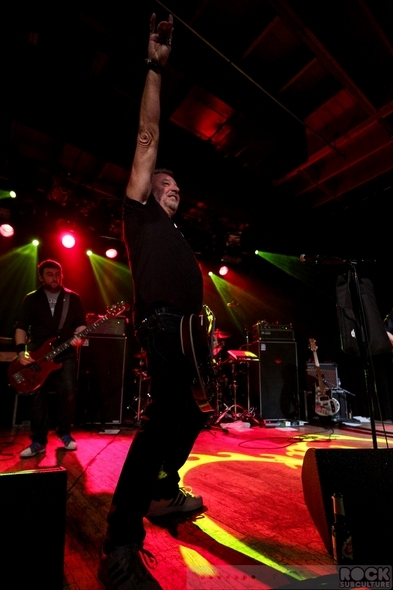 At one point in the show, a big guy a few rows of people off from center apparently took himself down with a bit too much alcohol, and at one point he fell onto the floor like a large tree cut at the base. 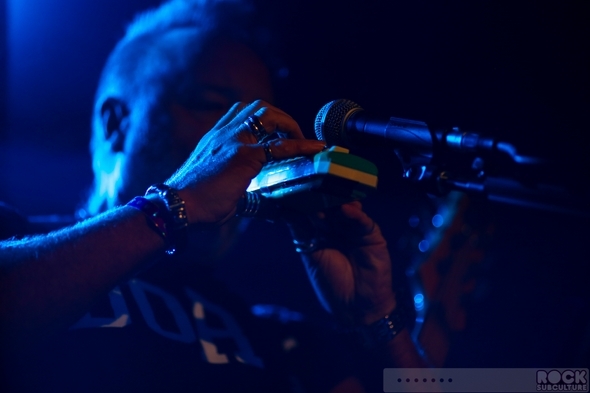 As the band finished up a song, Hooky peered over to see if he was alright, and made a funny aside about that state of intoxication not being unfamiliar territory (to paraphrase a bit). I think one thing that no one could walk away from the venue without feeling is Peter Hook’s love for his son. I truly found the whole dynamic between them quite genuine and touching. 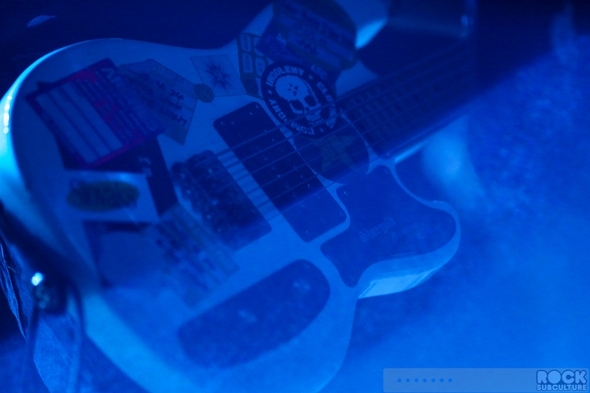 You could see mutual pride and joy flowing between them, and this came across in the music. 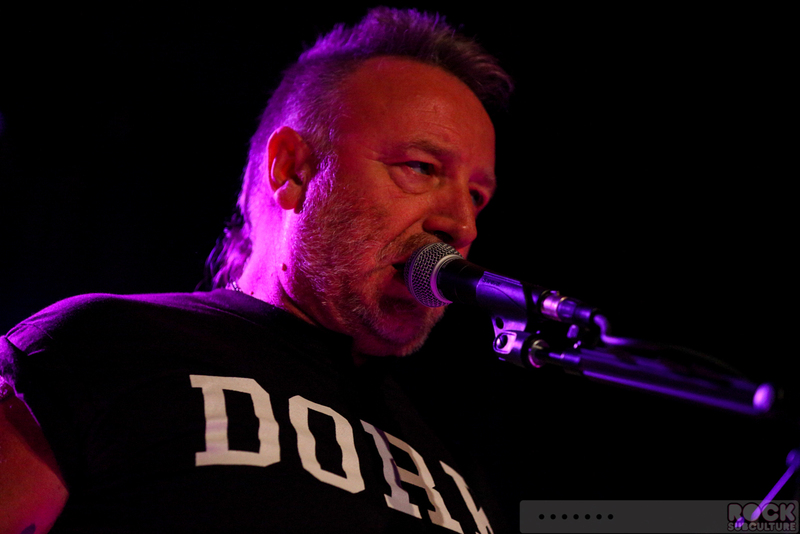 Joy is contagious, and it was really a feel good night of great music being created by a real icon in both the post punk and New Wave movements. The man is a legend, and to have an opportunity to be part of his current take on that great music, in an intimate venue with a great crowd of real, longtime fans was really something special. I have to say that I really, really enjoyed this show immensely. There was just something special about hearing and feeling Peter Hook and The Light bring this music alive in such a genuine and visceral way. 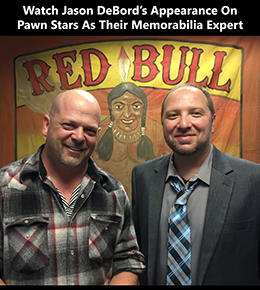 It just felt more real and authentic to me. Truly an unforgettable experience, and I’m actually a little bummed I’m only catching this tour one time. 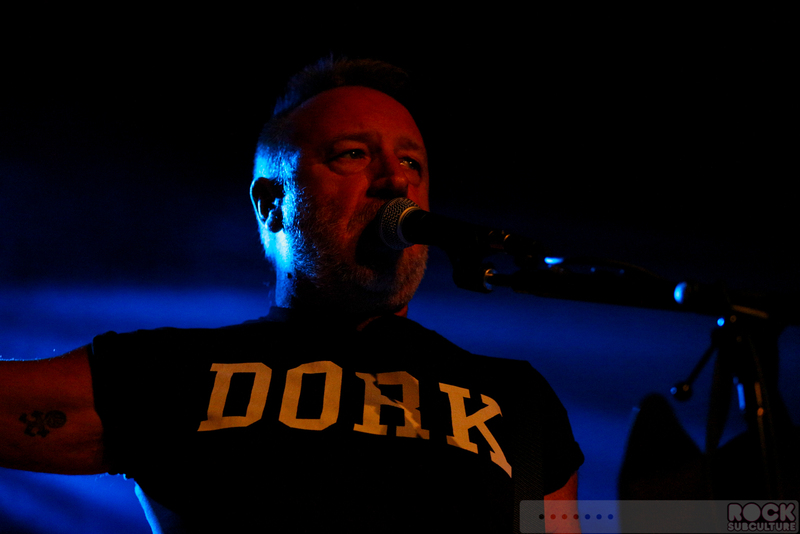 After closing things out with an incredible rendition of “Blue Monday”, Hooky pulled off his “DORK” tank top and gave it to the woman standing next to me in the audience, who I chatted with a bit and is a huge fan. 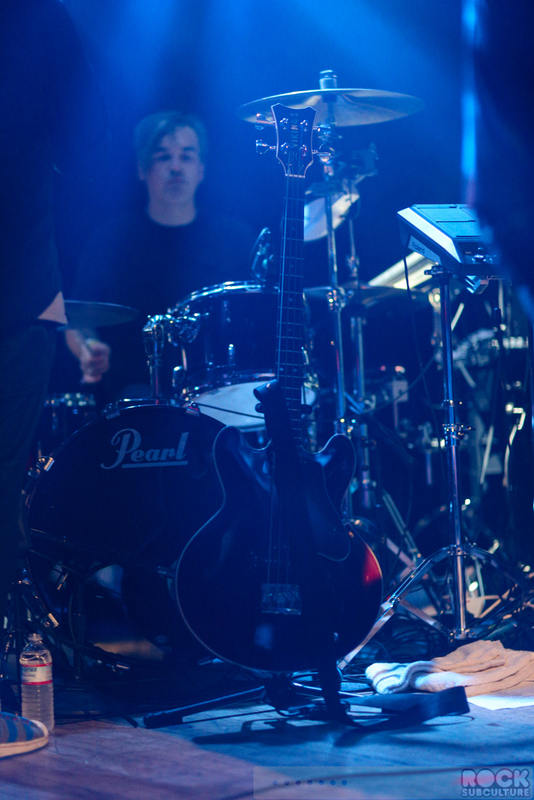 The mix of cologne and sweat was a bit overpowering, but she was beaming with happiness over her prize! I actually feel badly that Peter Hook and New Order parted ways, but came away from the show feeling like maybe it was one of those “things happen for a reason” turn of events, as I can’t imagine Peter Hook experiencing the same joy without having his son on stage with him and cultivating his own gifts in such an amazing manner.